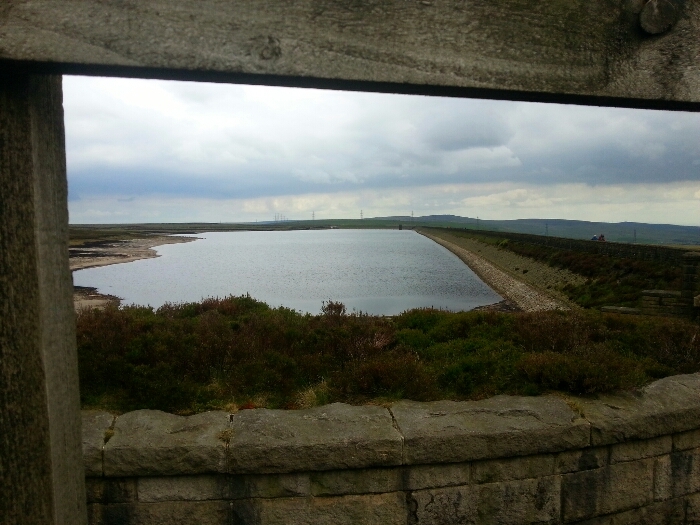 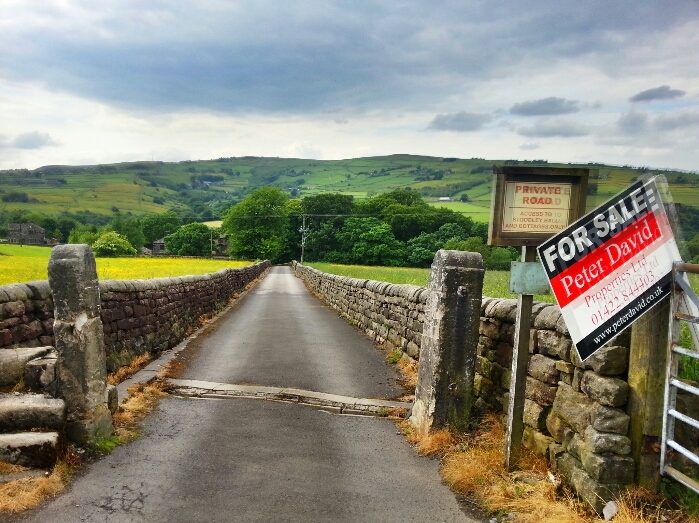 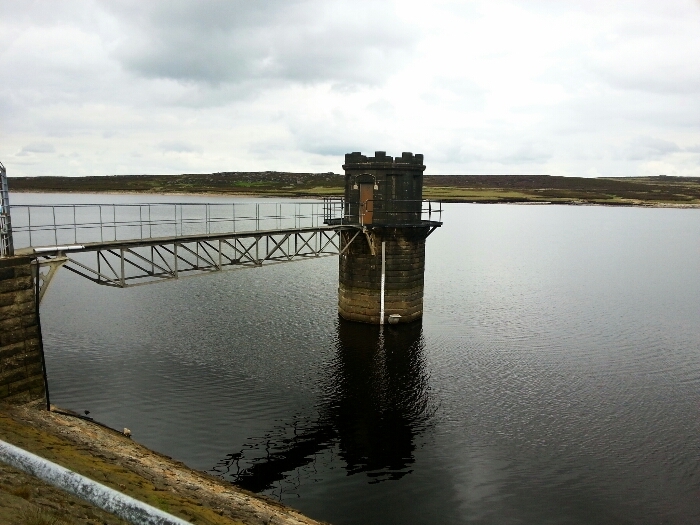 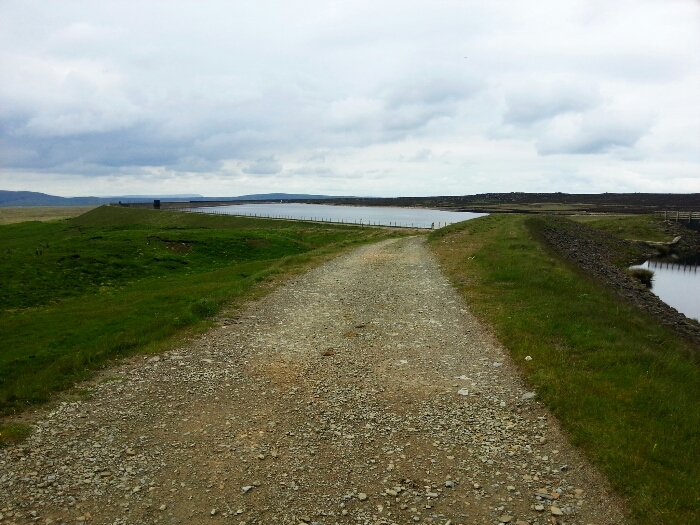 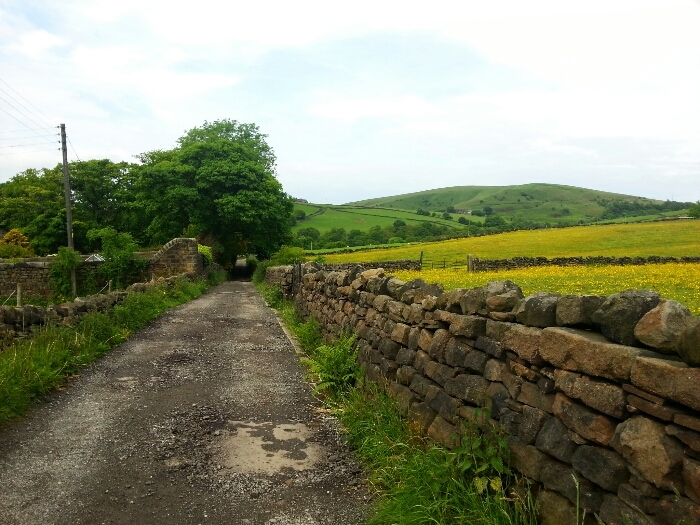 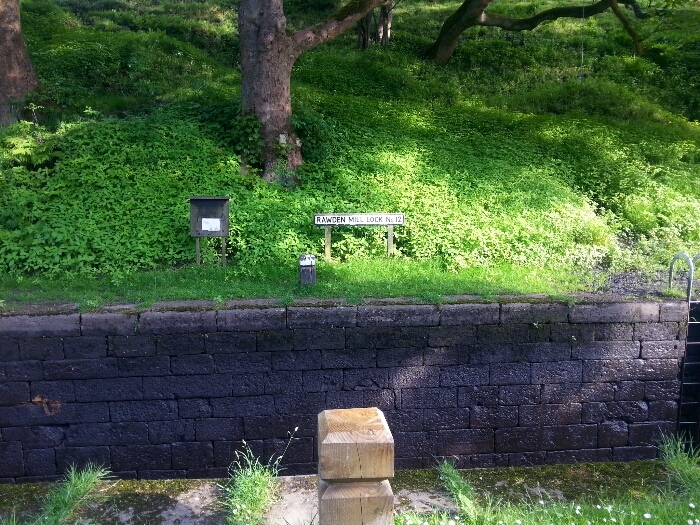 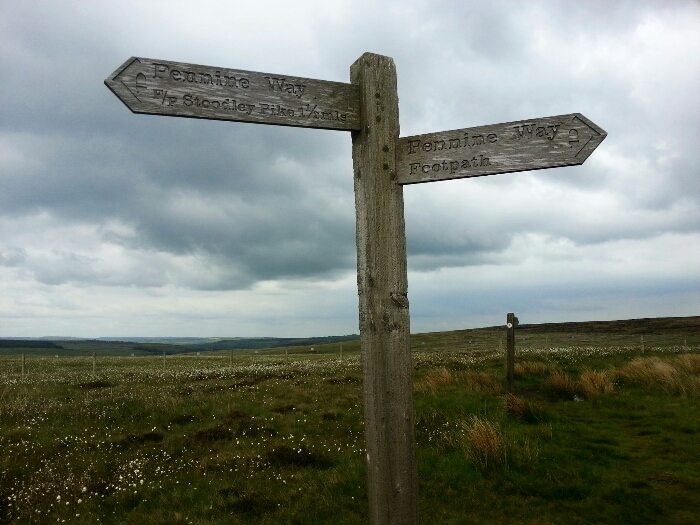 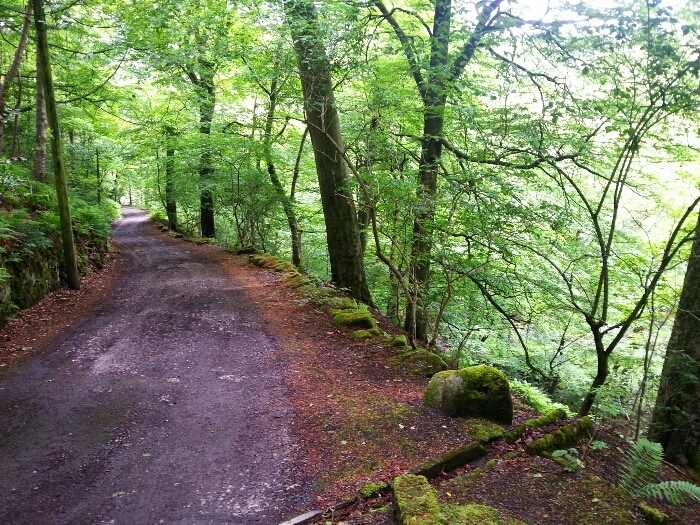 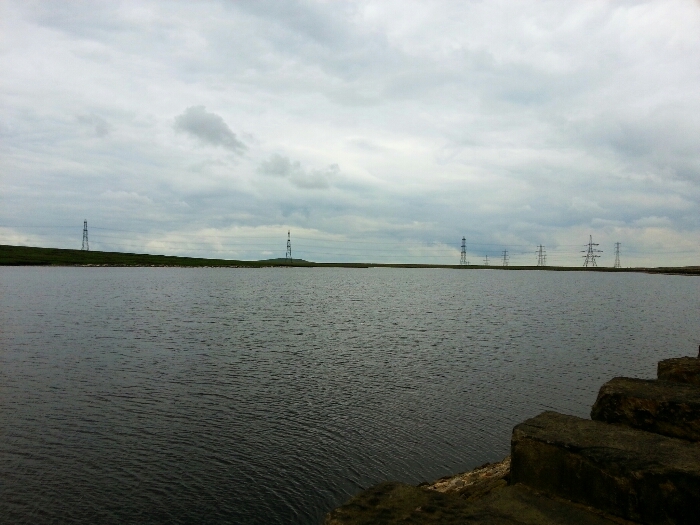 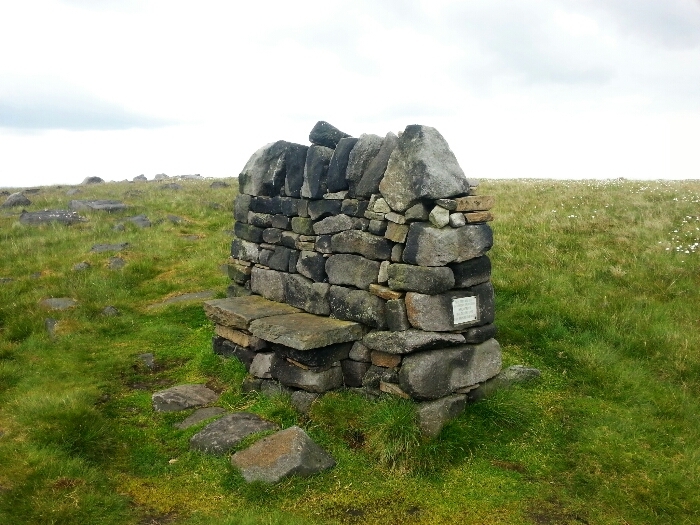 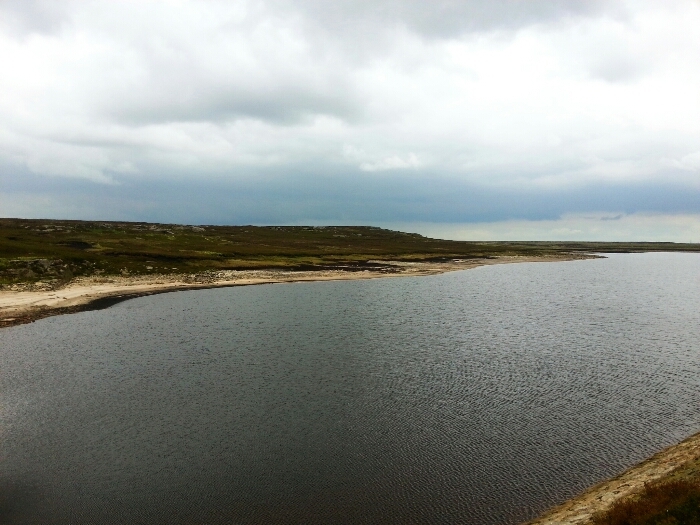 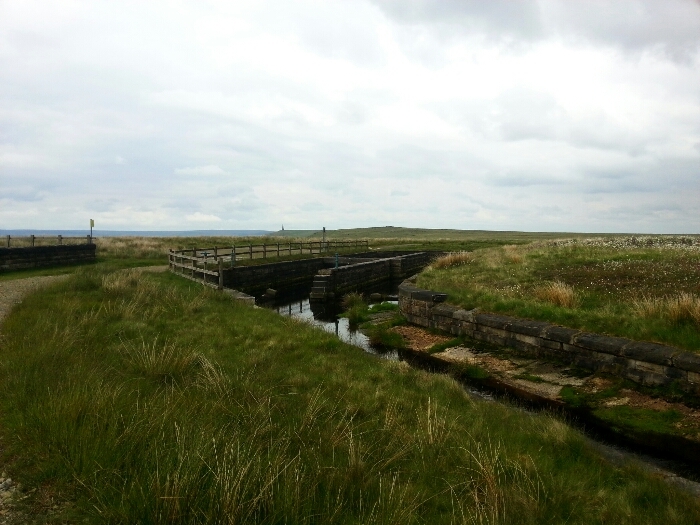 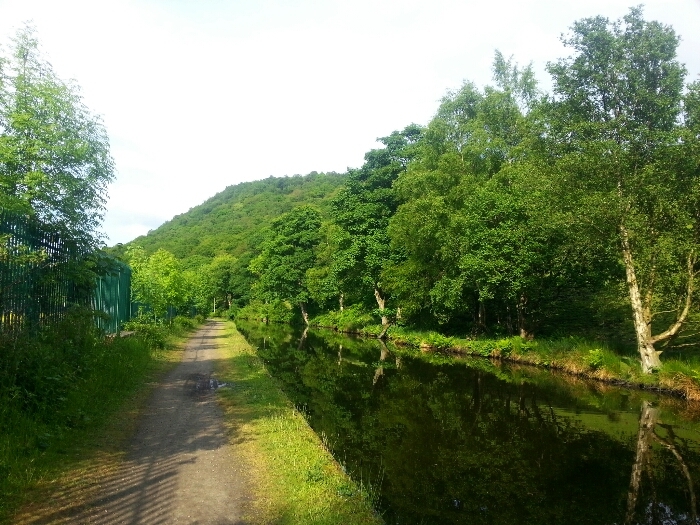 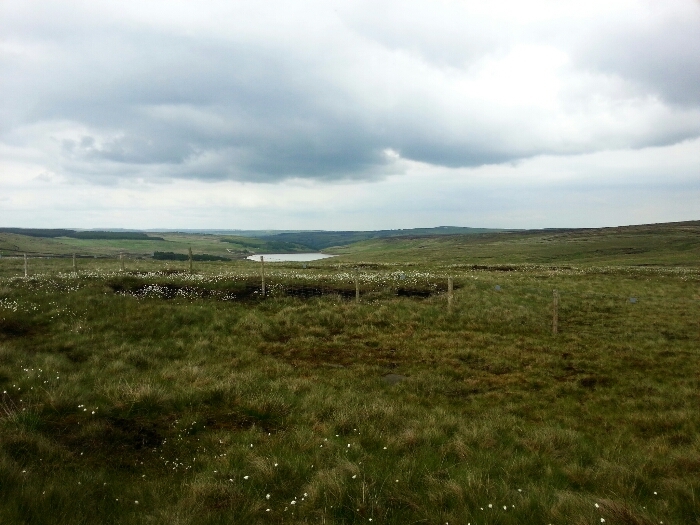 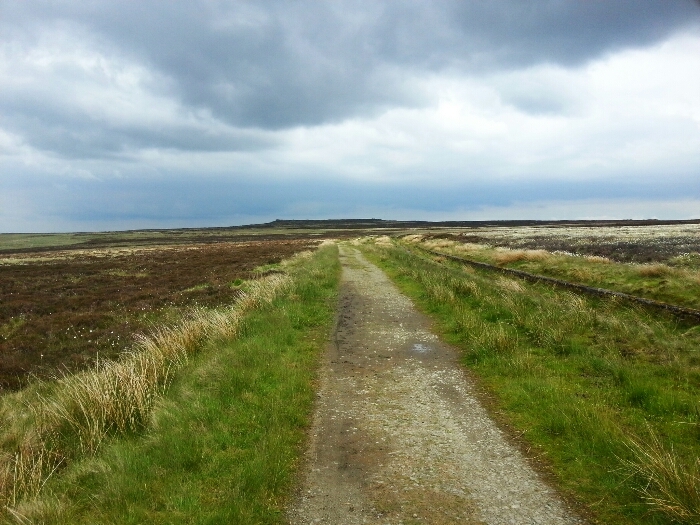 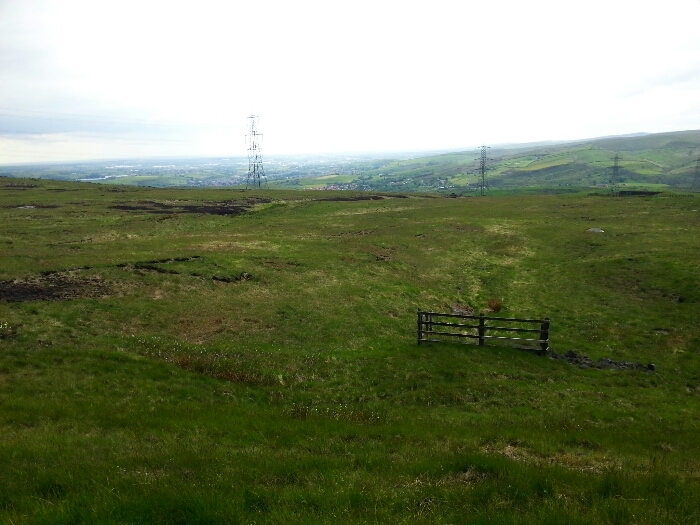 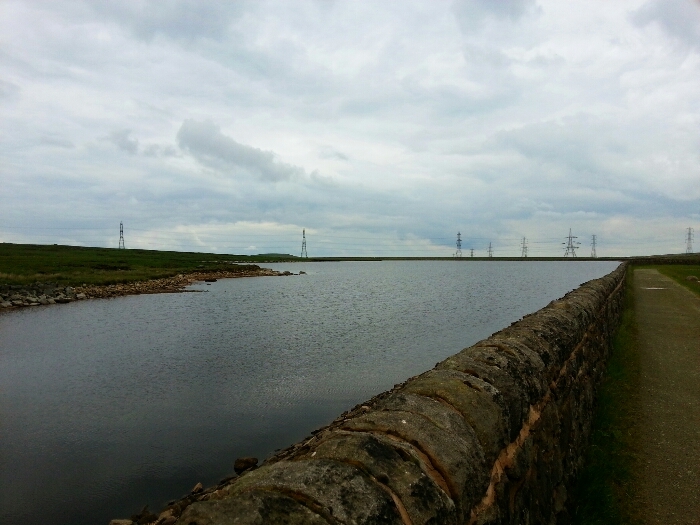 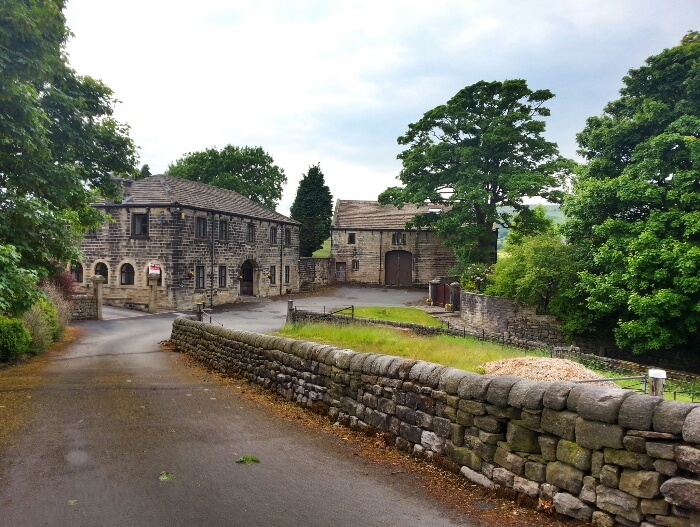 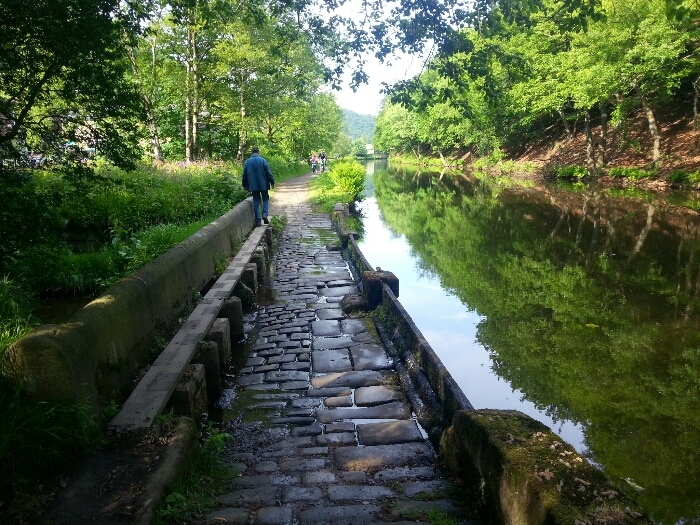 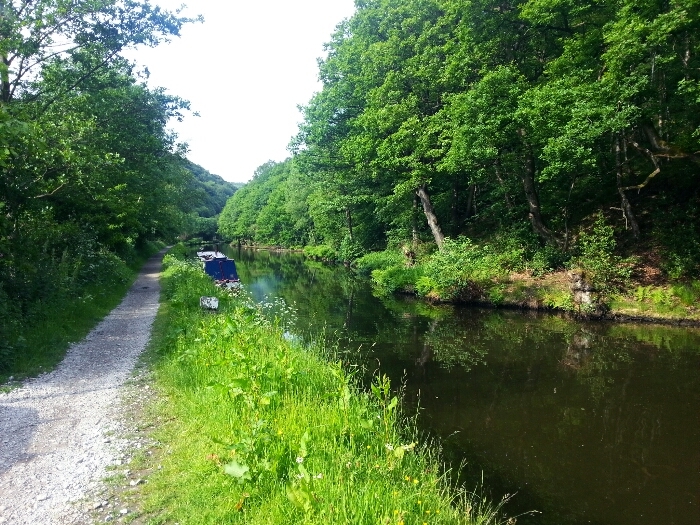 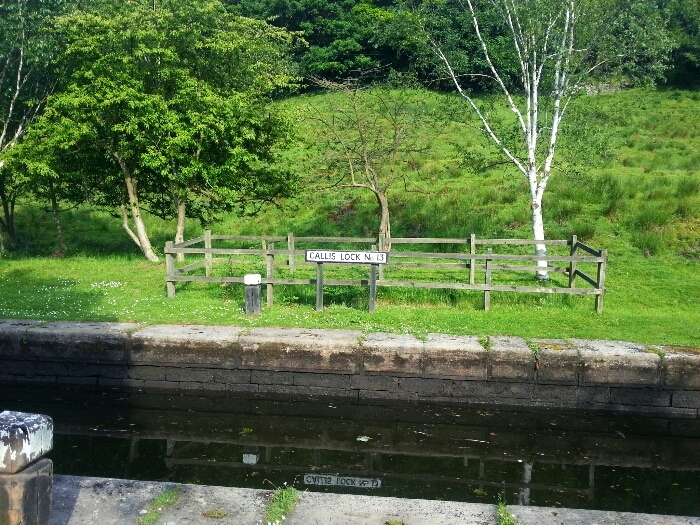 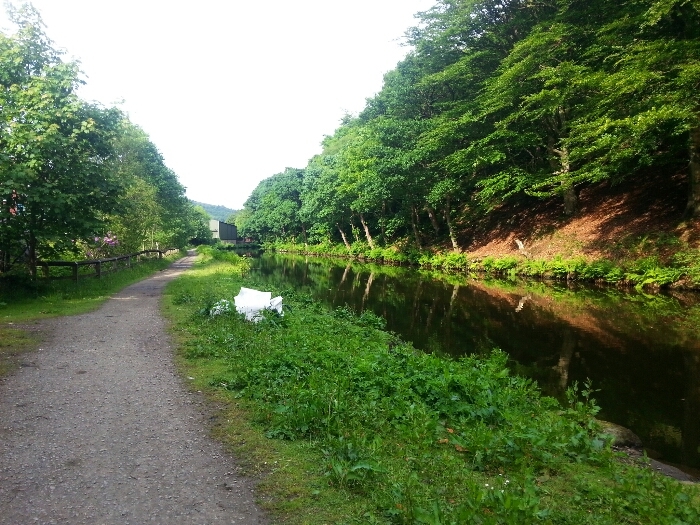 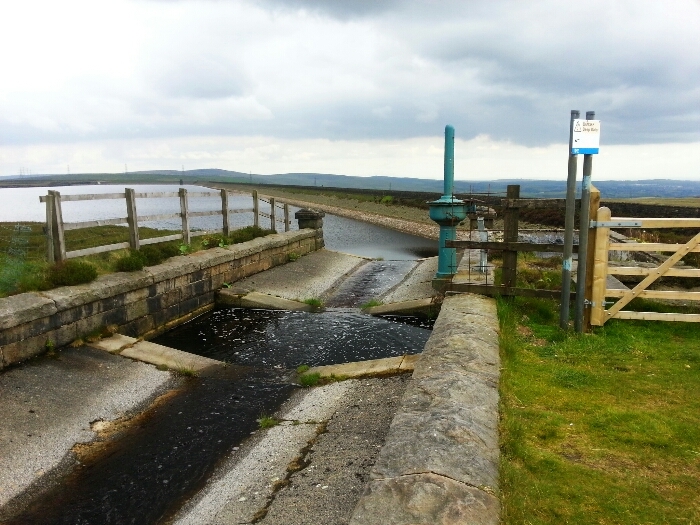 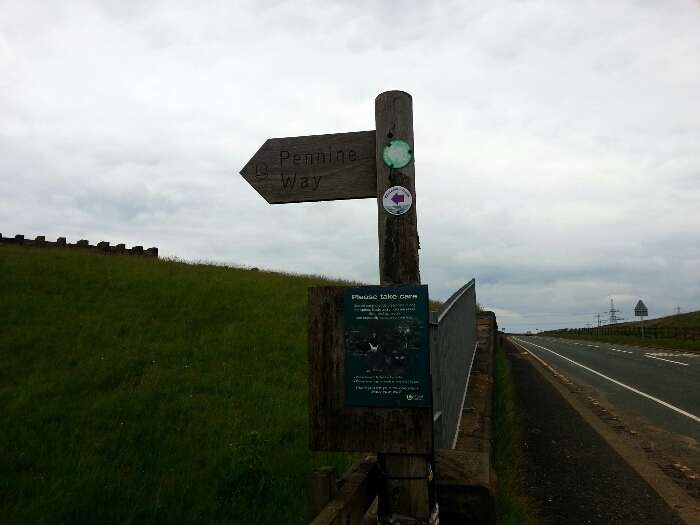 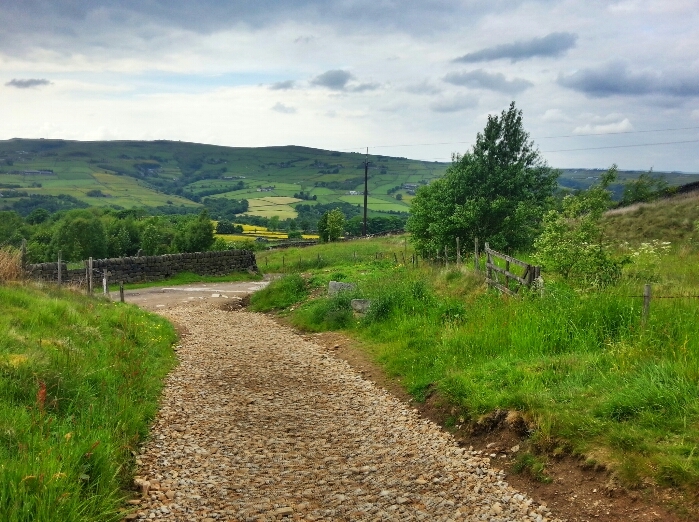 This starts as Moorland walk that follows the route of the Pennine Way for part of the way and then becomes a canalside walk at the end of the route. 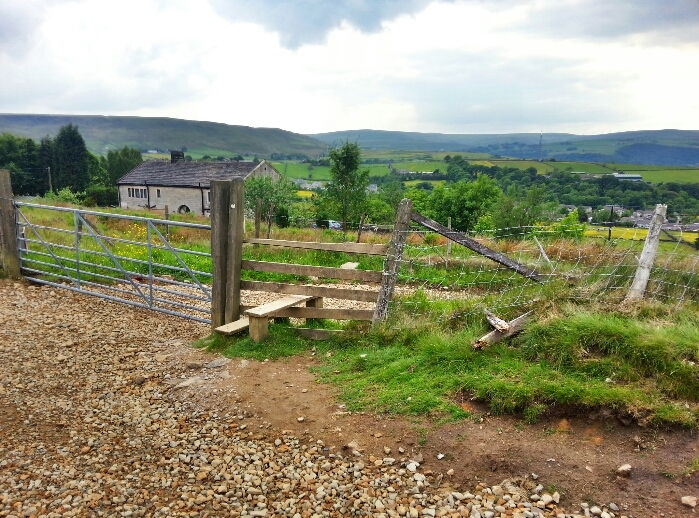 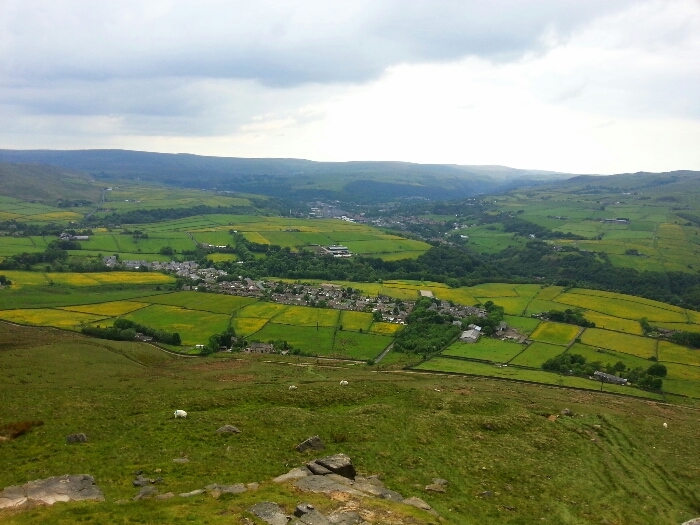 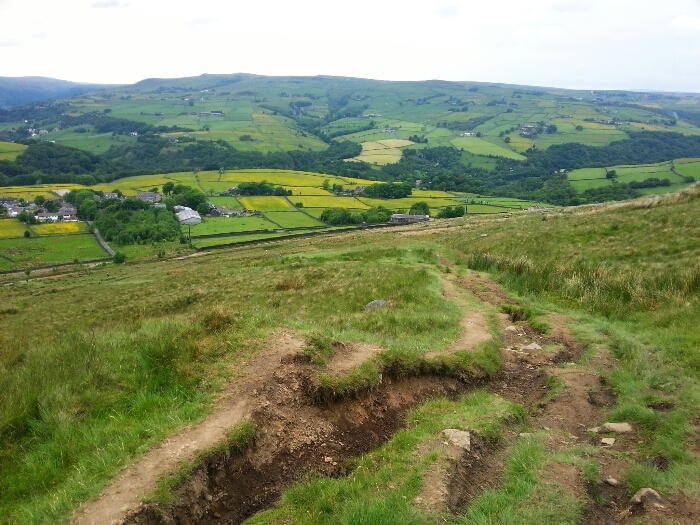 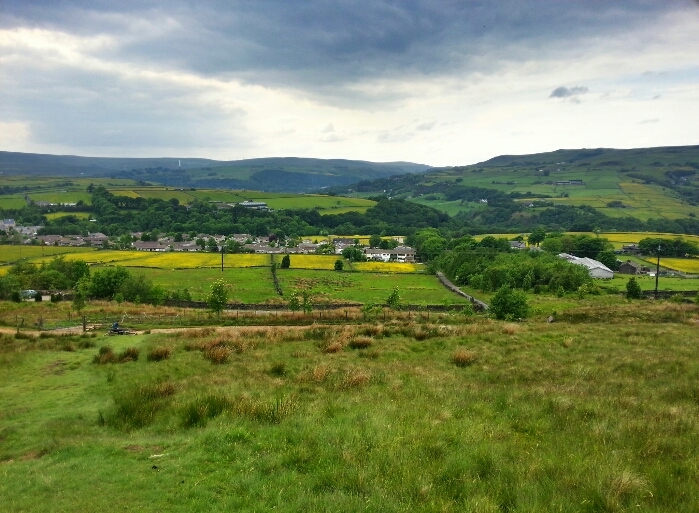 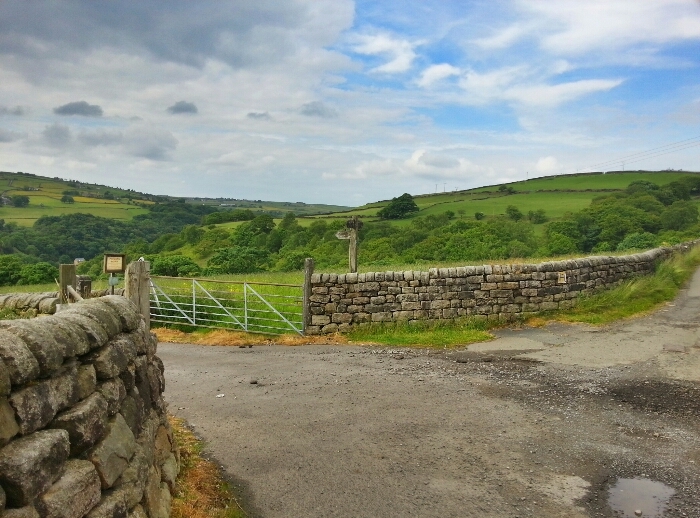 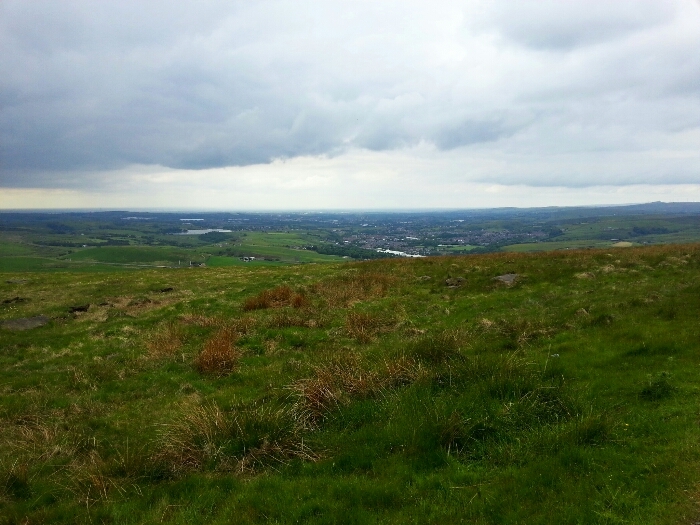 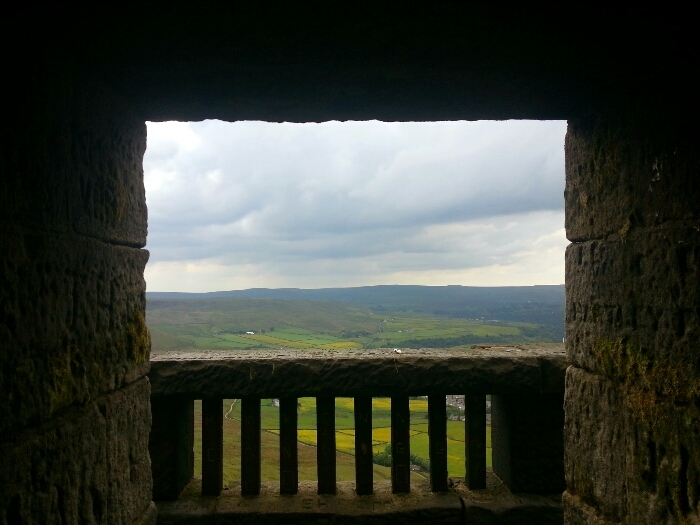 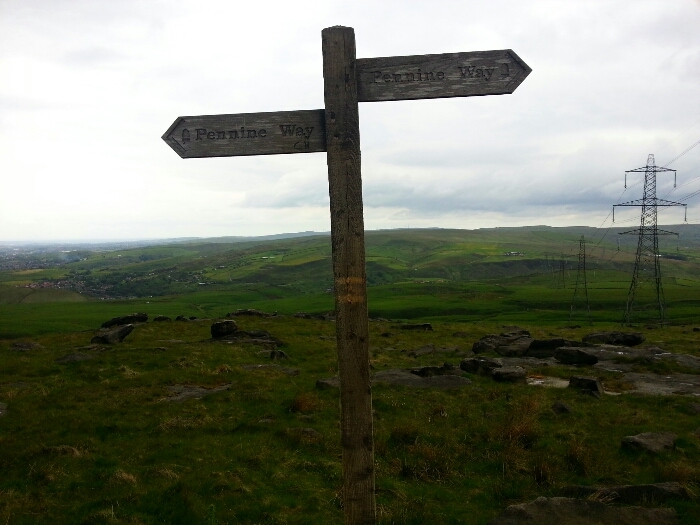 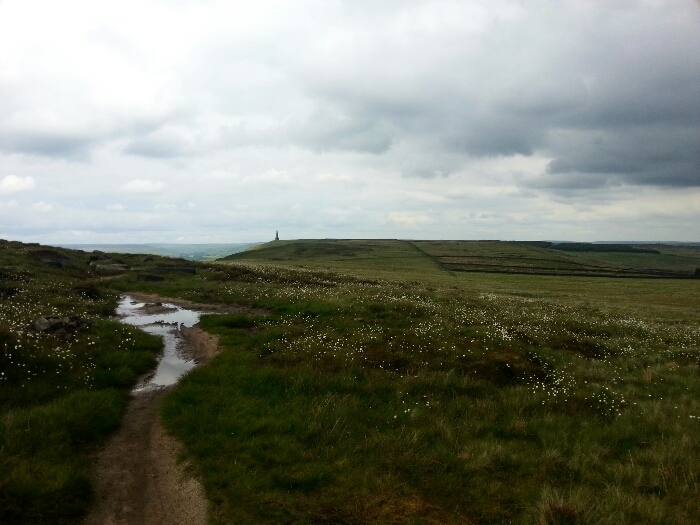 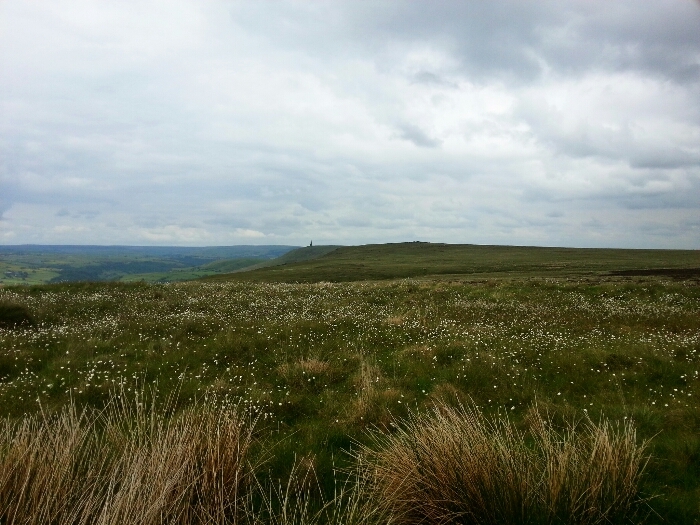 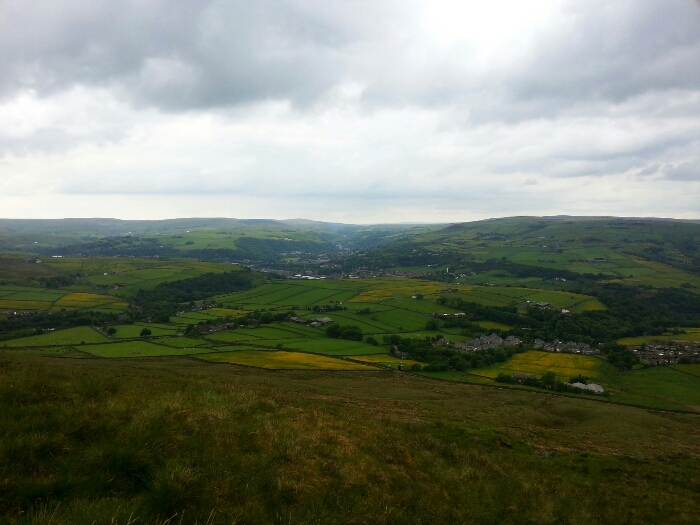 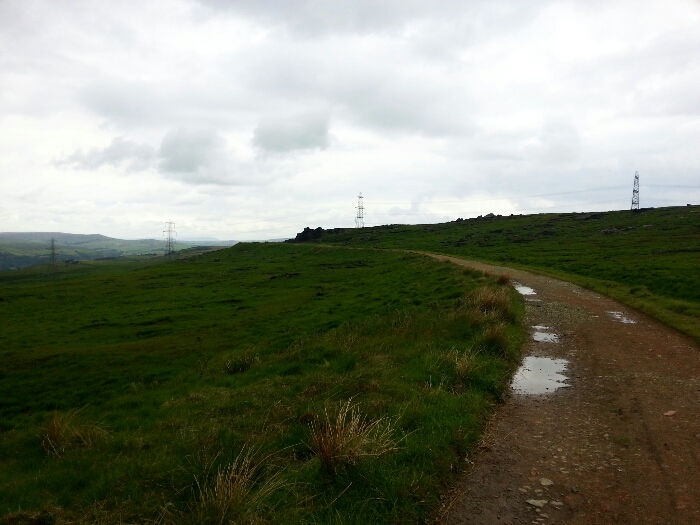 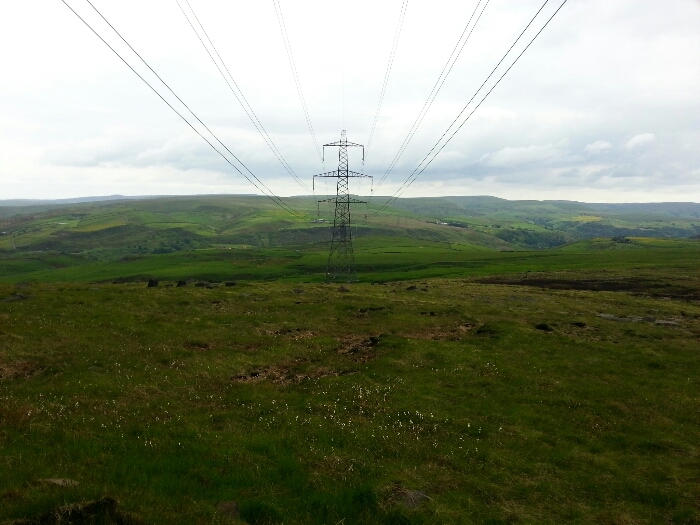 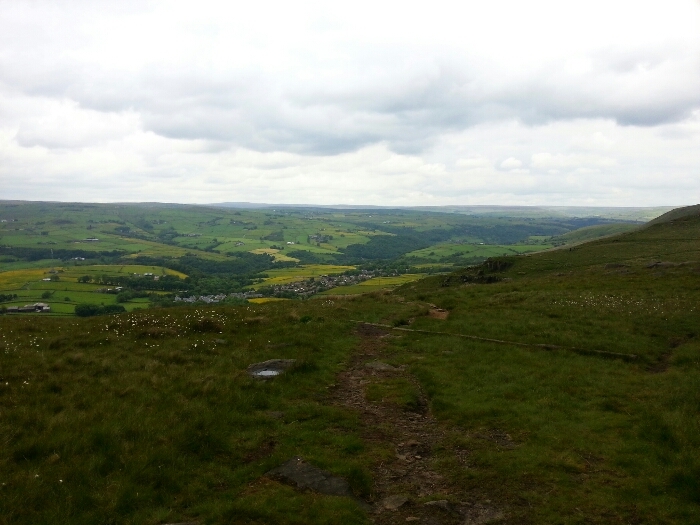 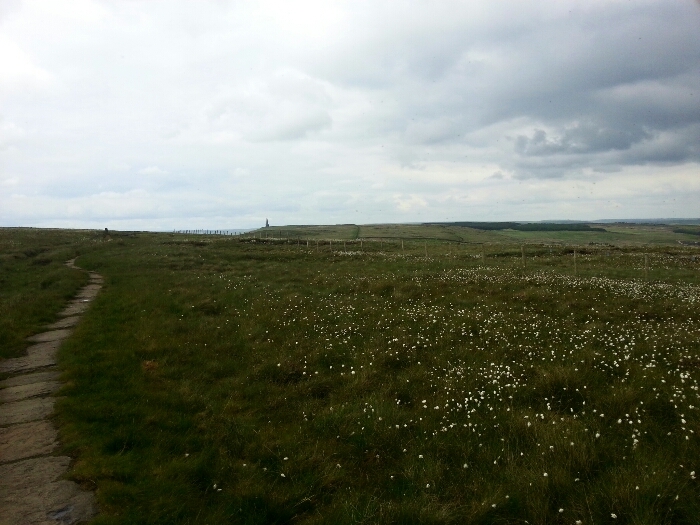 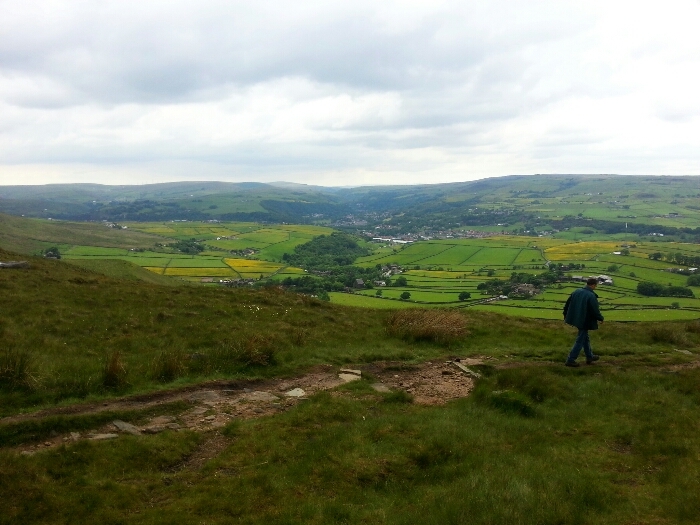 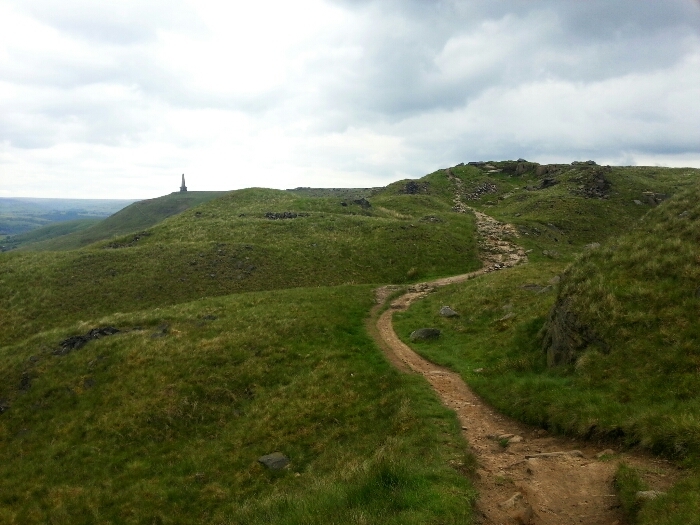 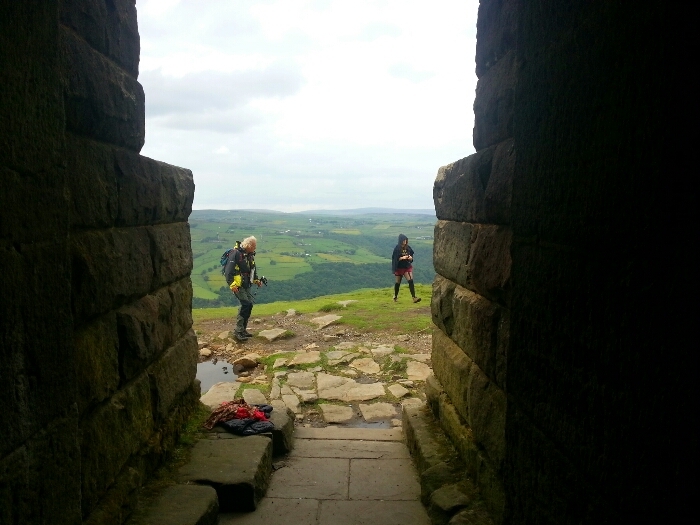 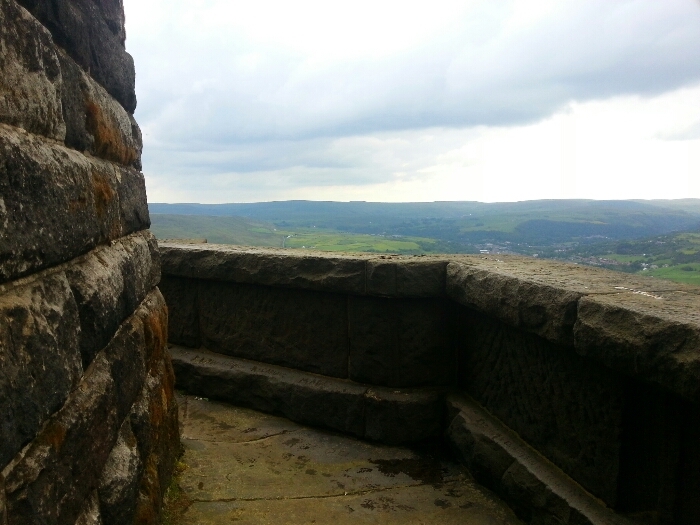 The most difficult part of this walk is the drop down from Stoodley Pike into the valley below. 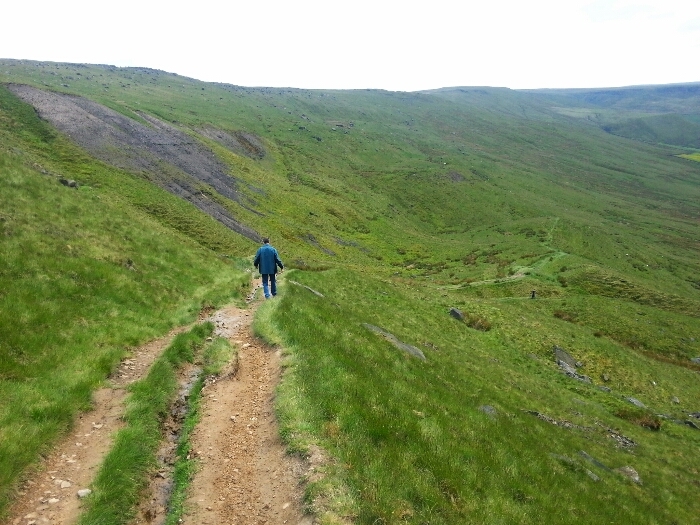 This is a steep and rugged path the rest of the walk is relatively flat and easy. 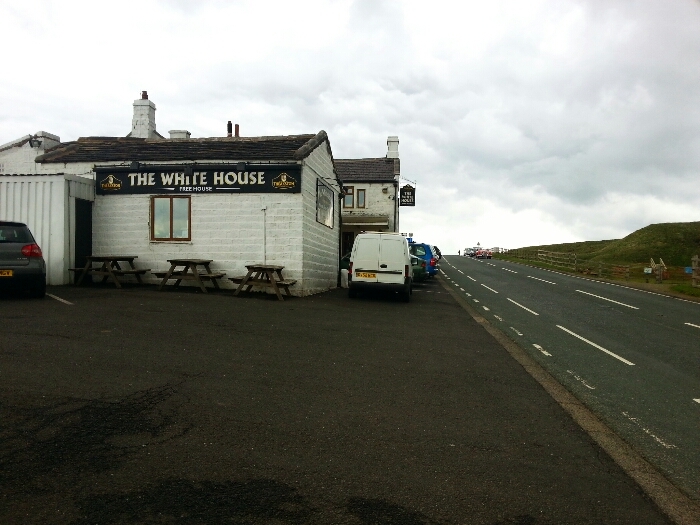 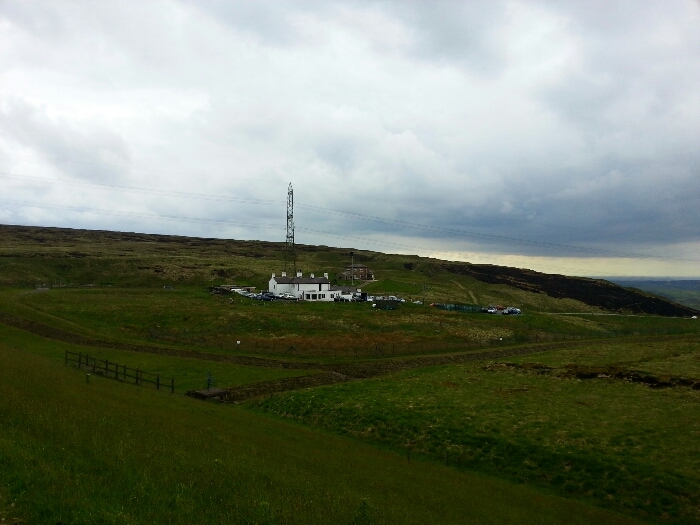 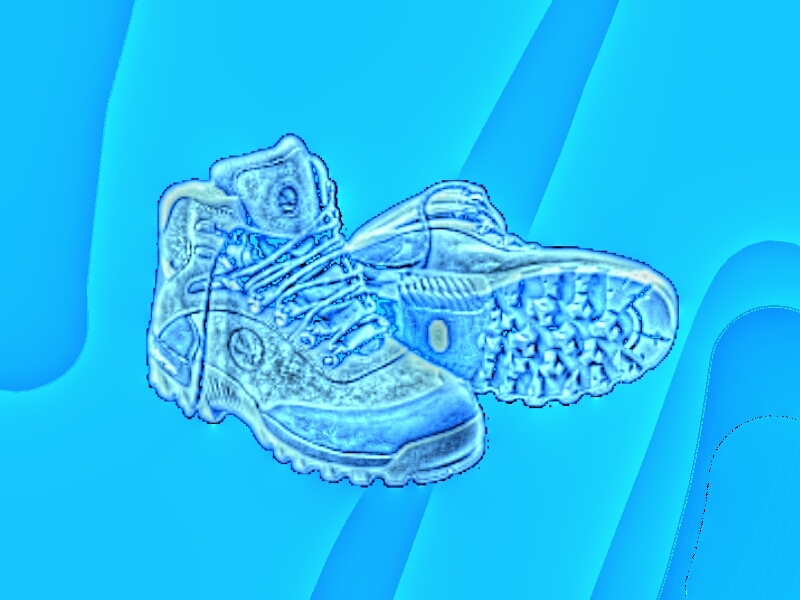 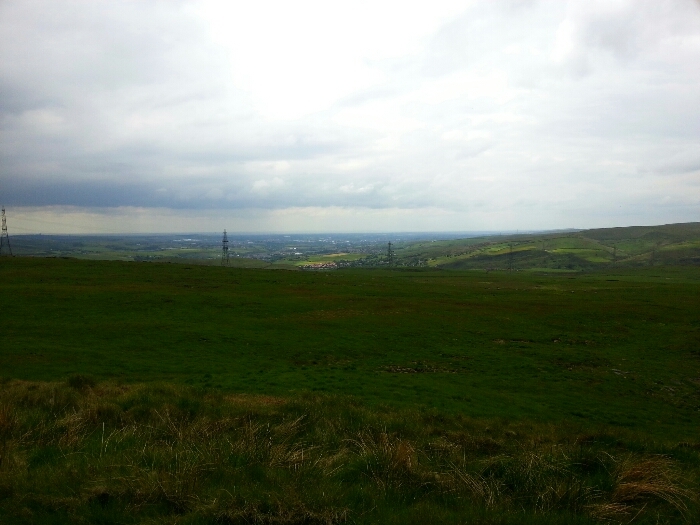 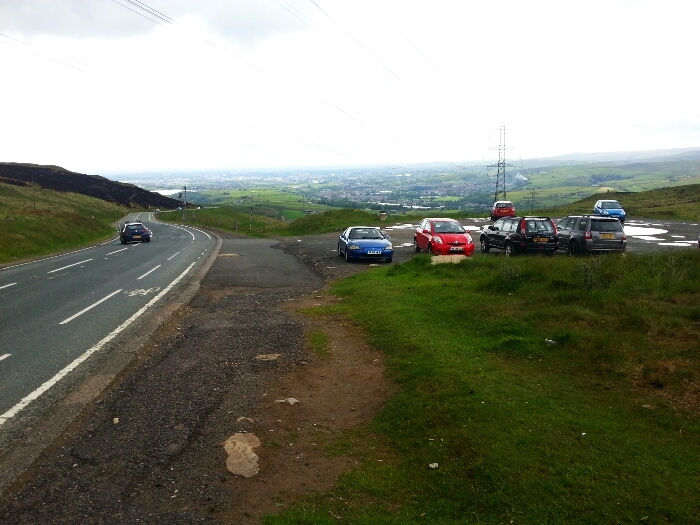 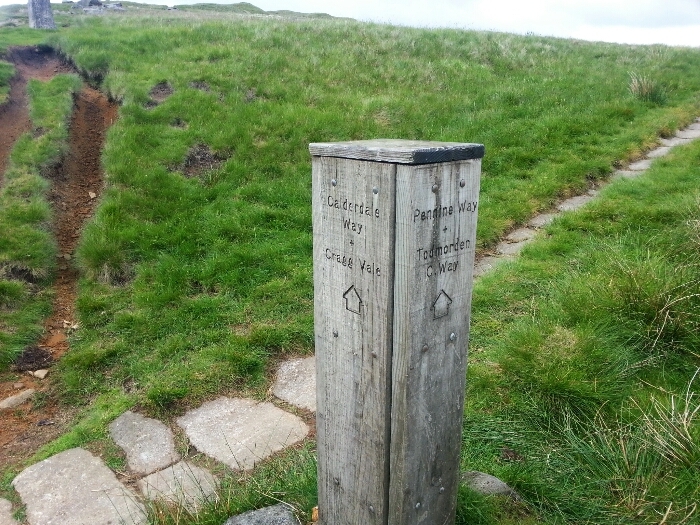 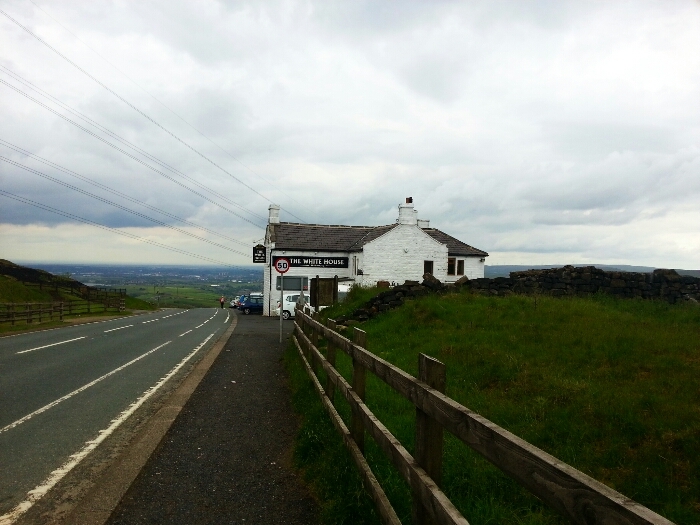 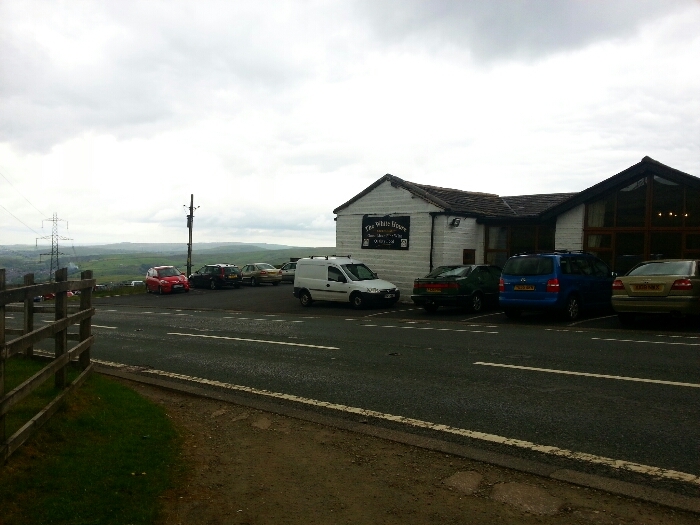 This walk starts at the White House pub just to the western side of the summit of the A58 between Rochdale and Halifax. 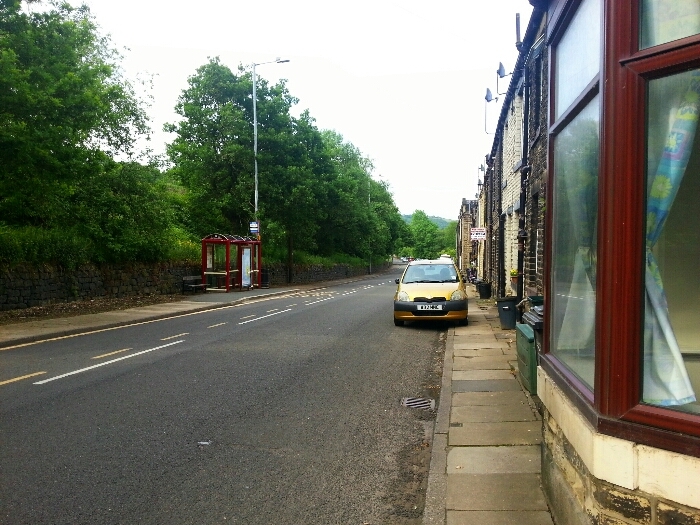 The number 528 bus Halifax to Rochdale bus passes here approximately once an hour in each direction. 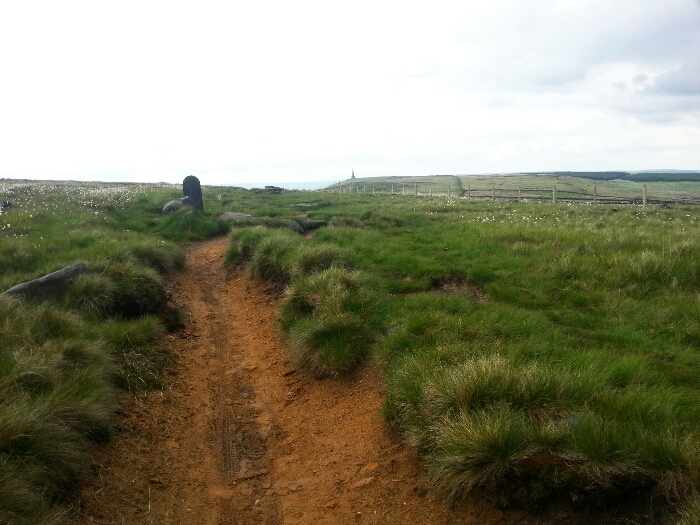 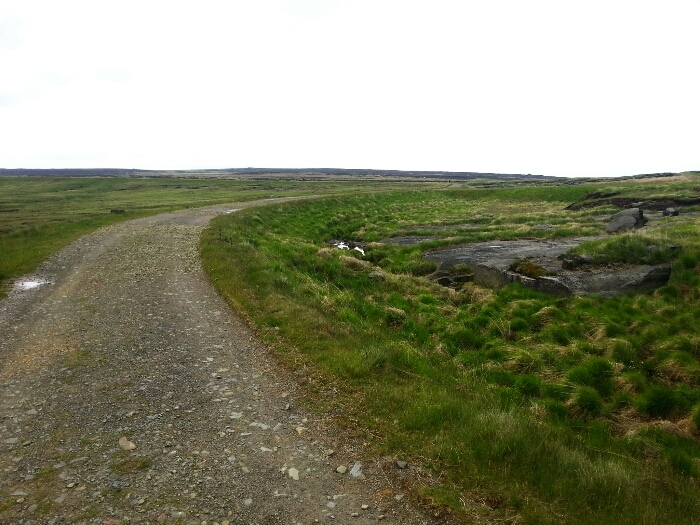 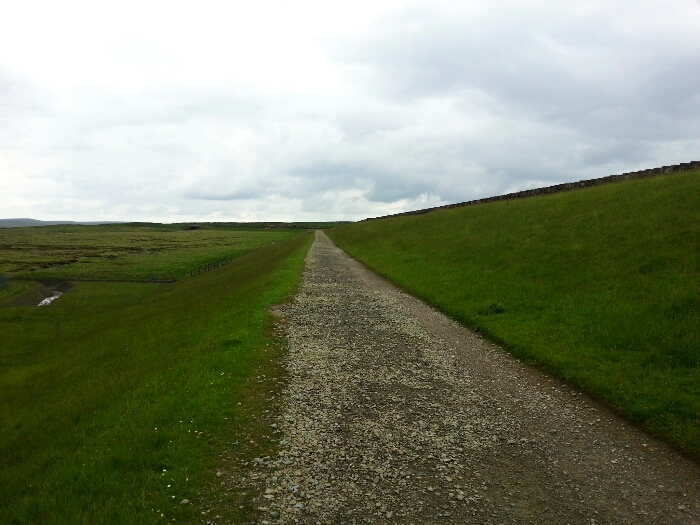 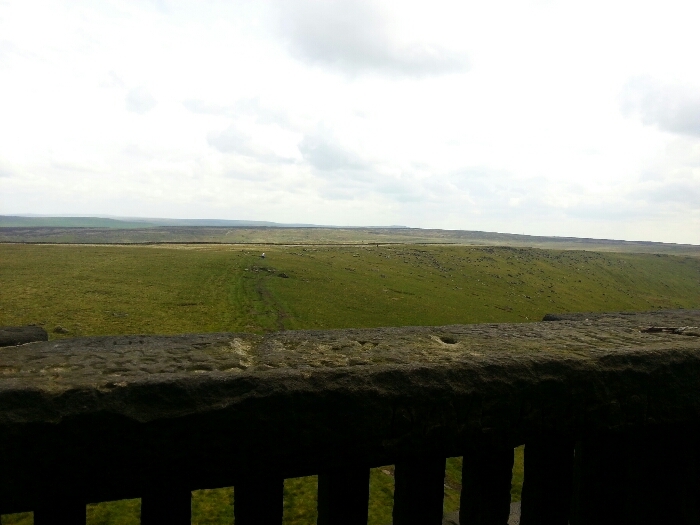 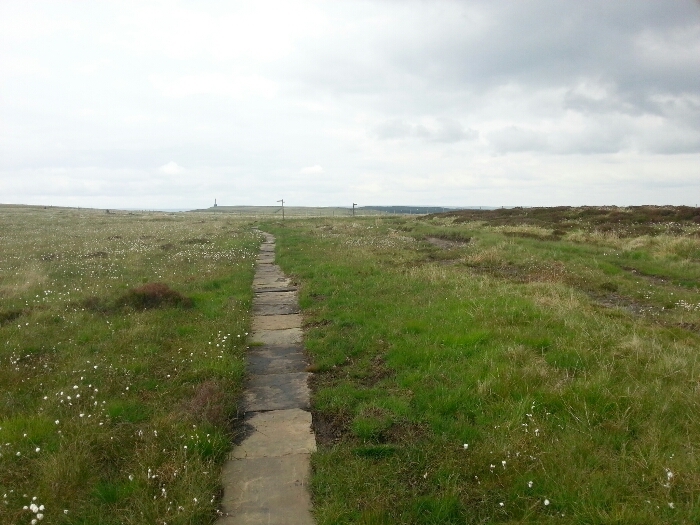 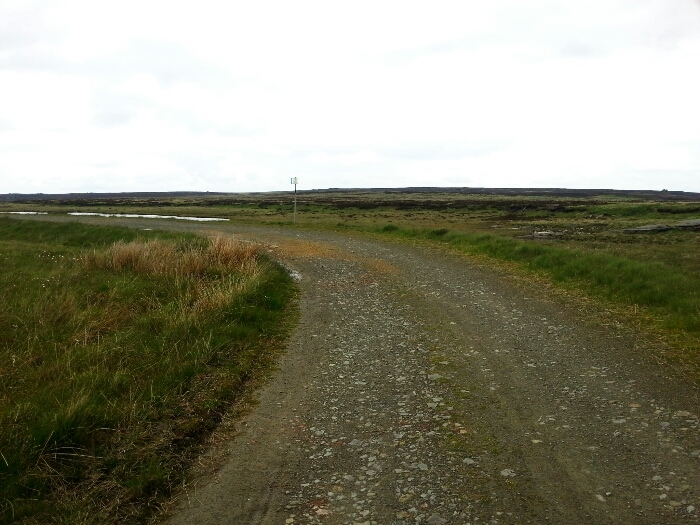 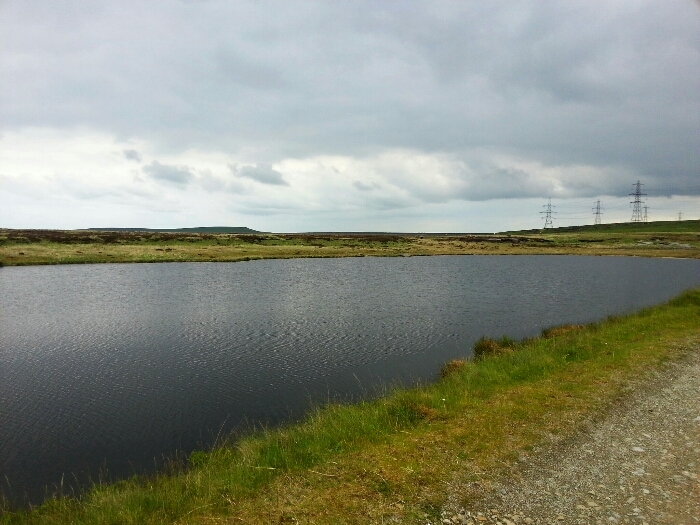 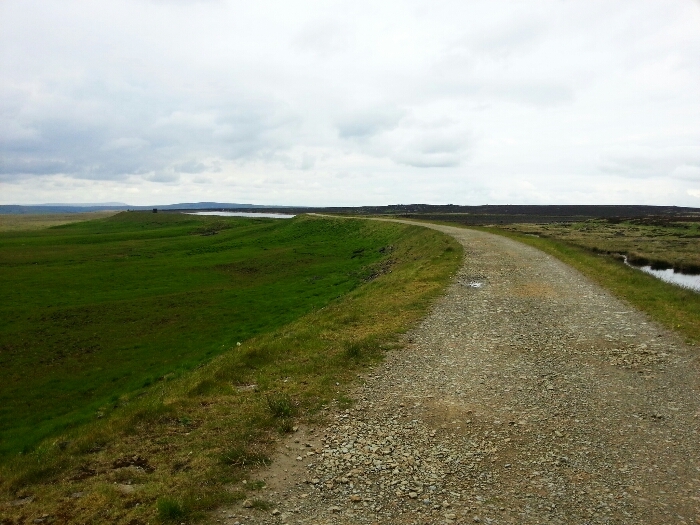 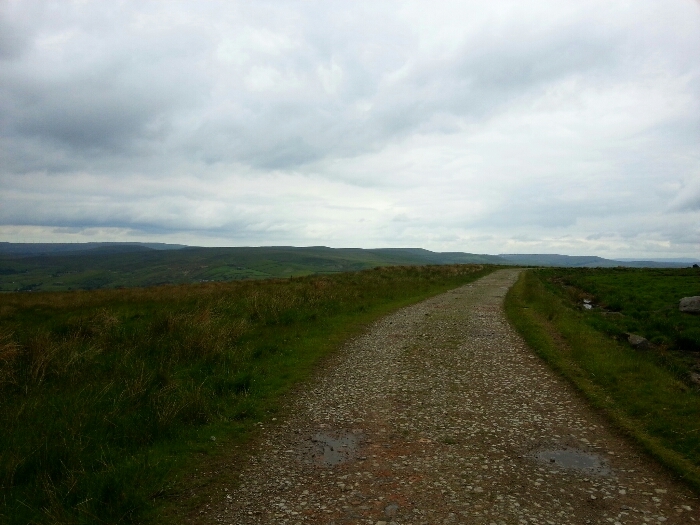 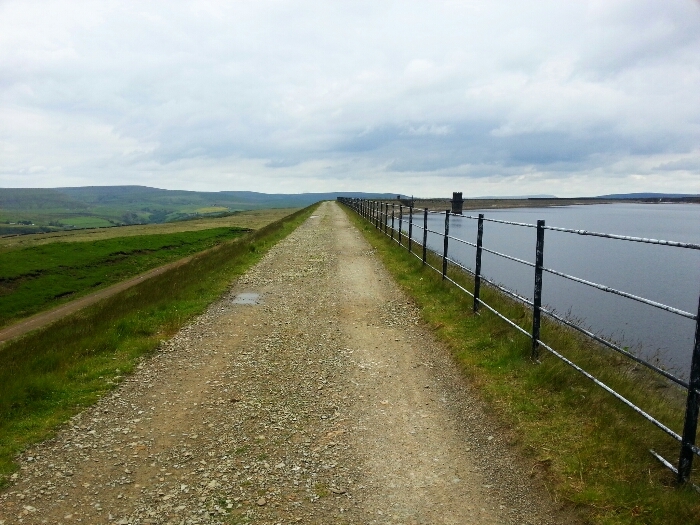 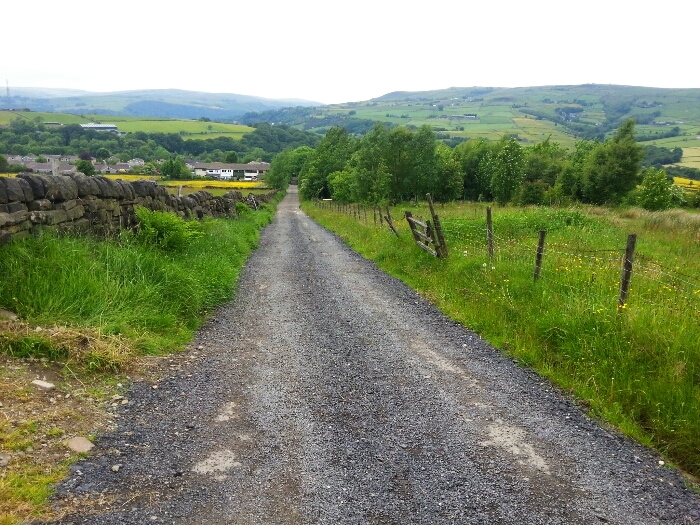 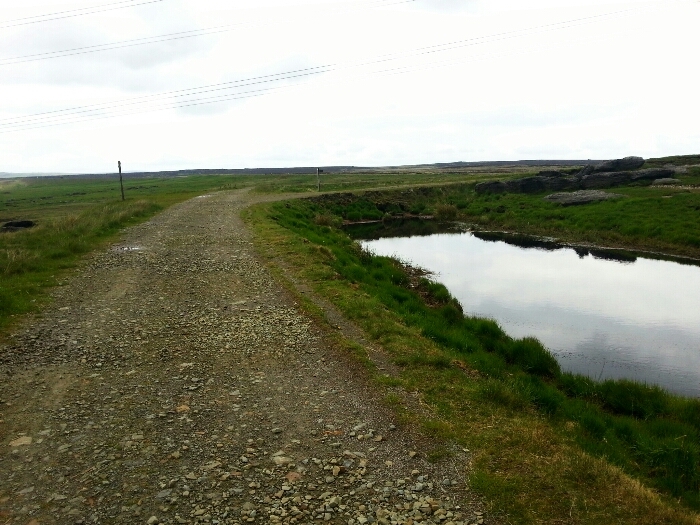 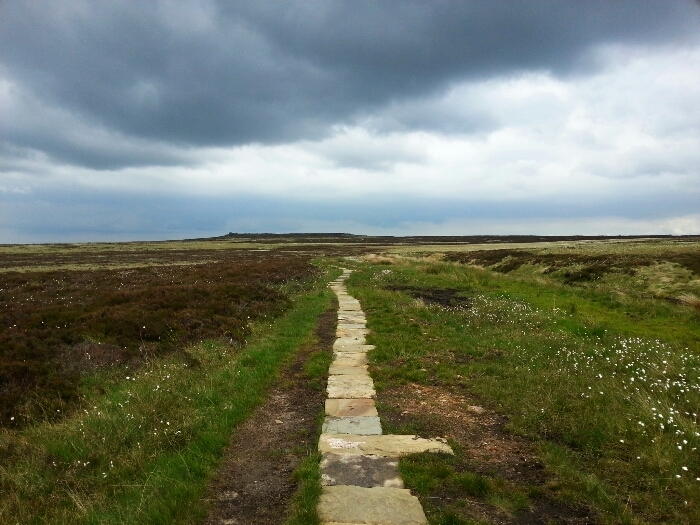 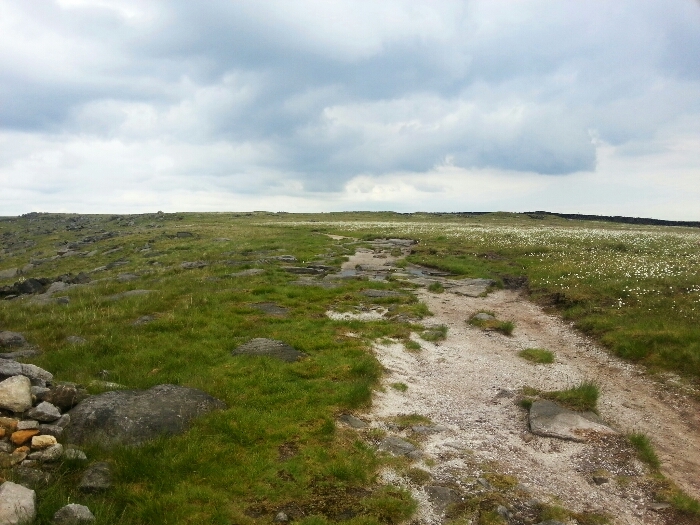 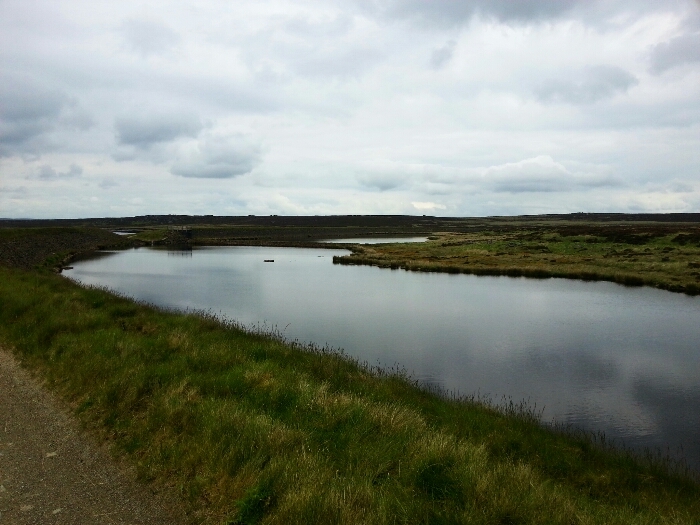 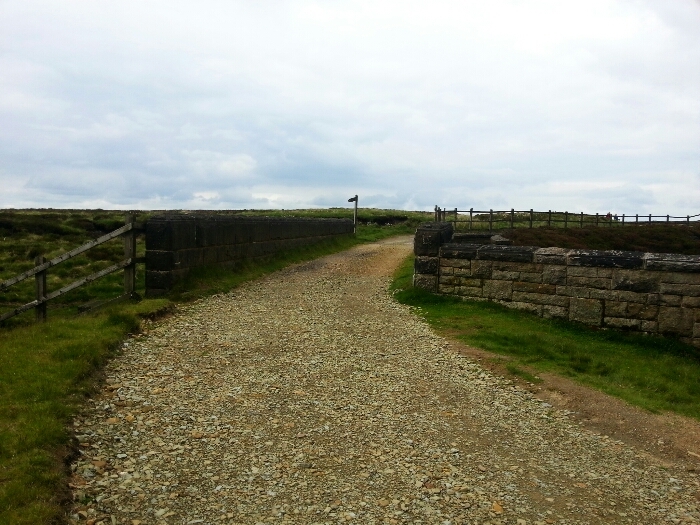 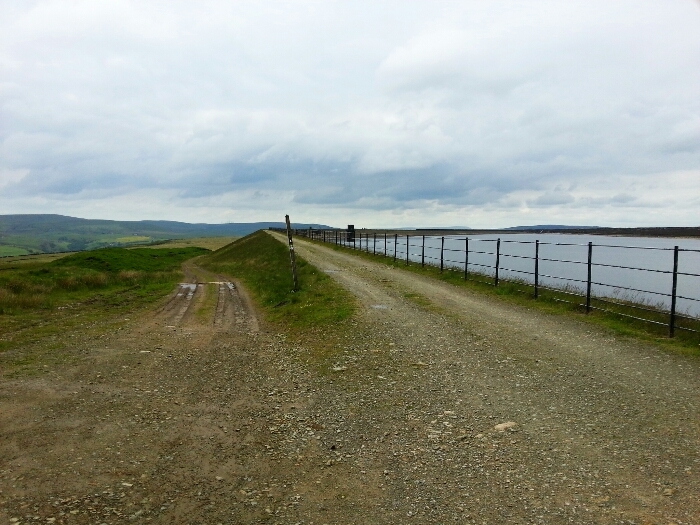 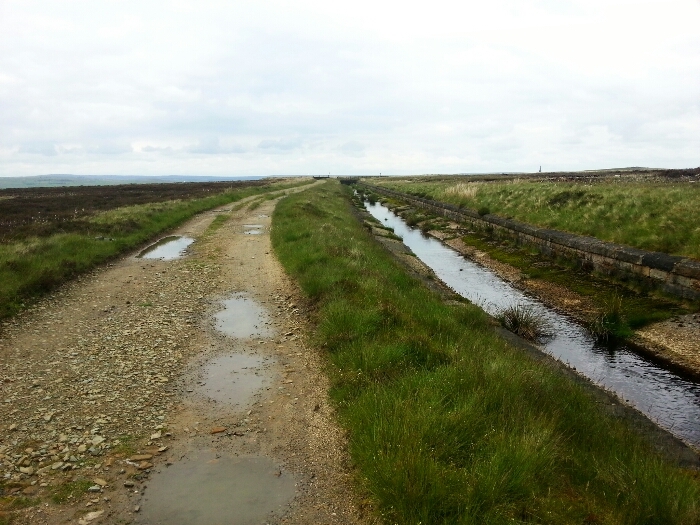 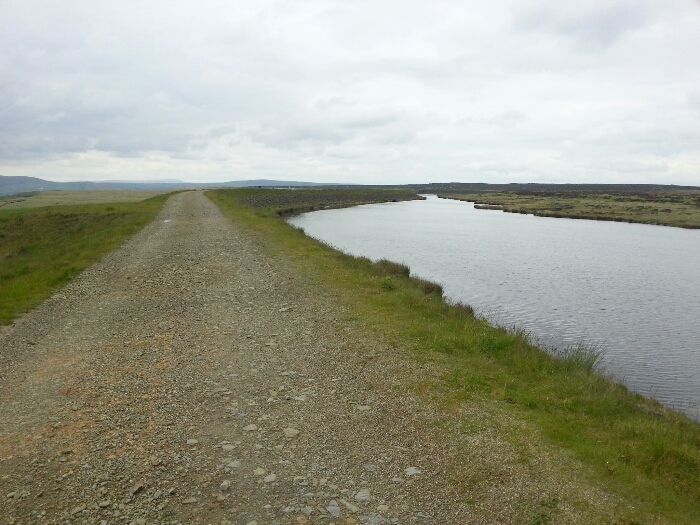 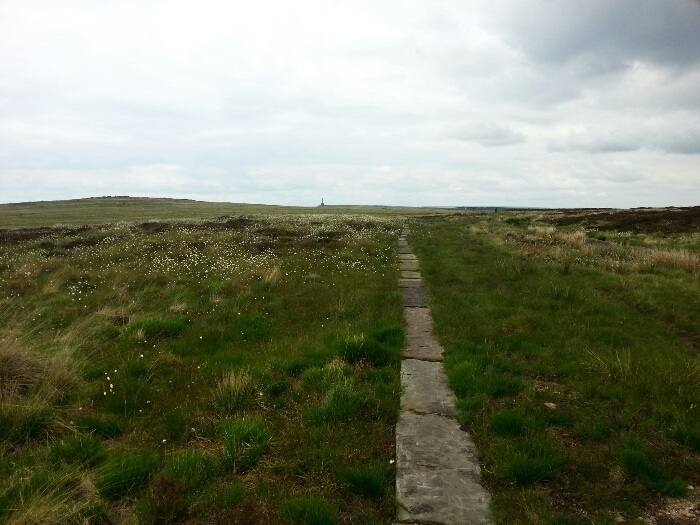 As we cross the Moors much of the route is paved this has been done to stop erosion. 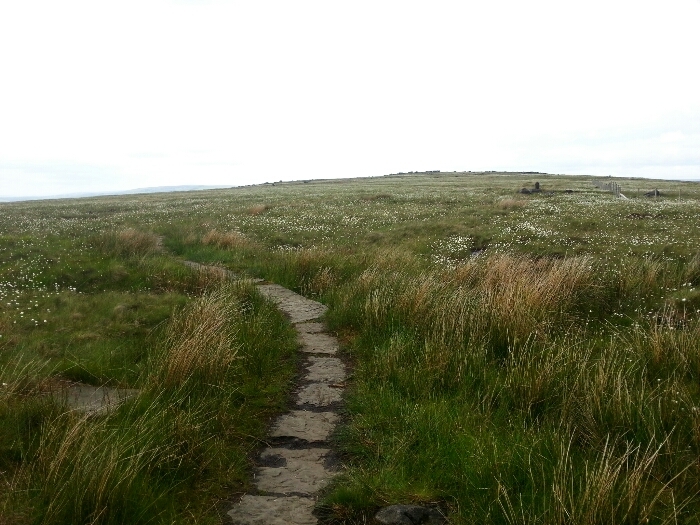 Without the paving this path would be a a muddy mire as even on a dry day the area is a like a sponge. 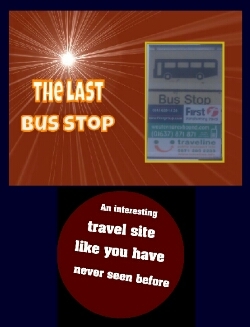 Heres a little bit of history and a geography lesson combined. 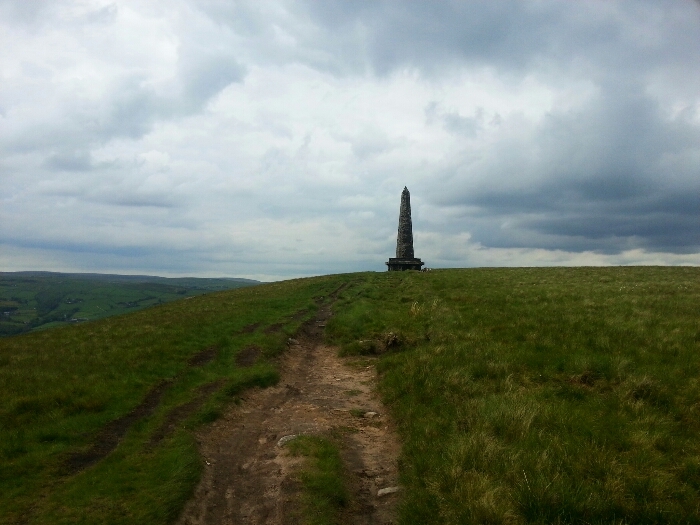 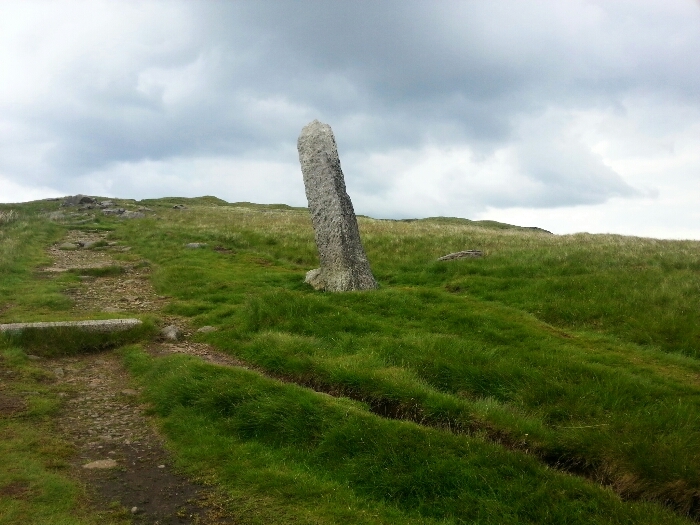 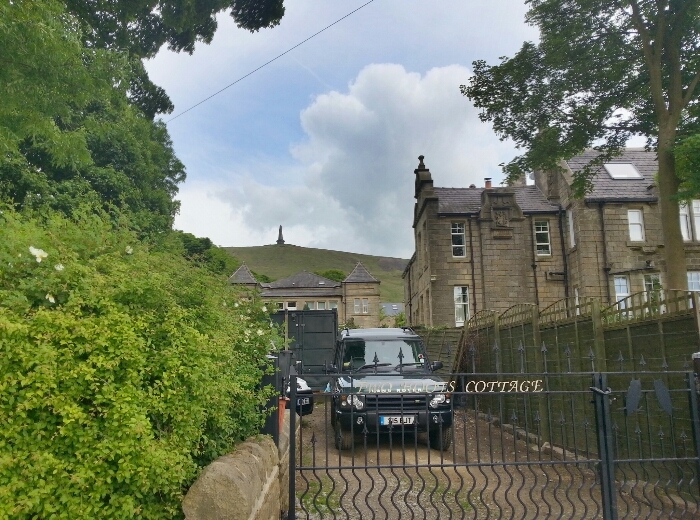 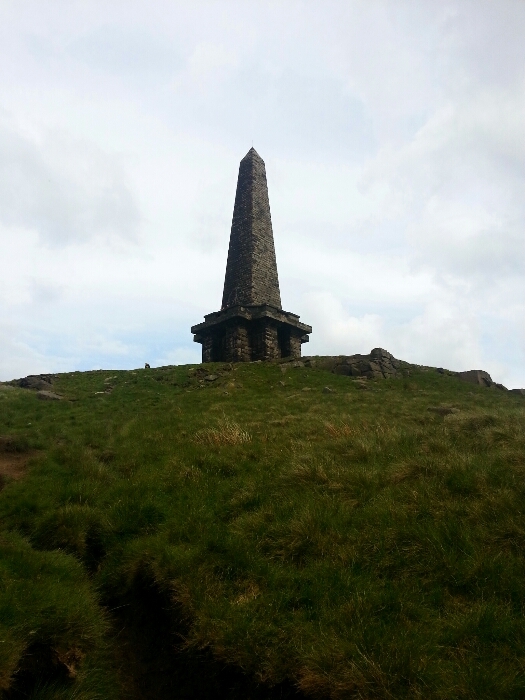 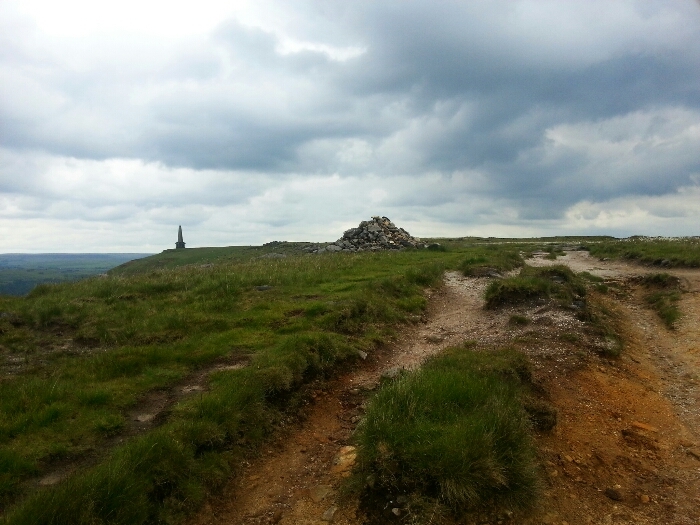 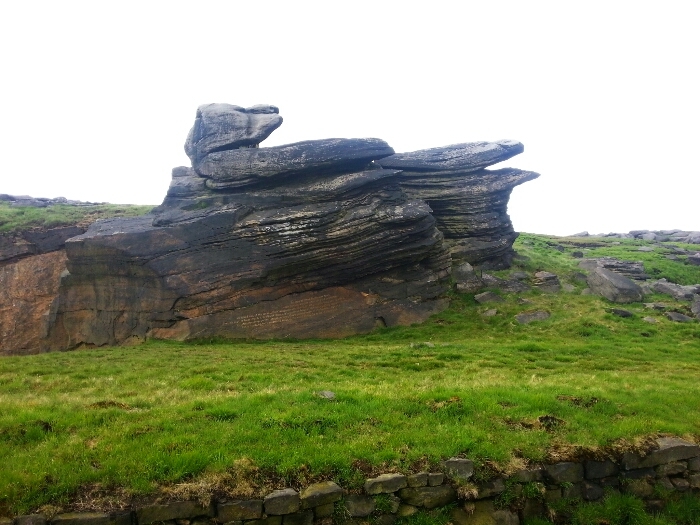 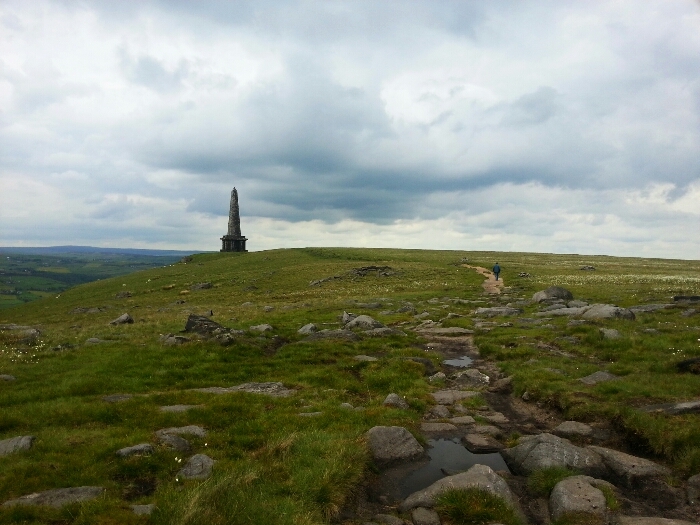 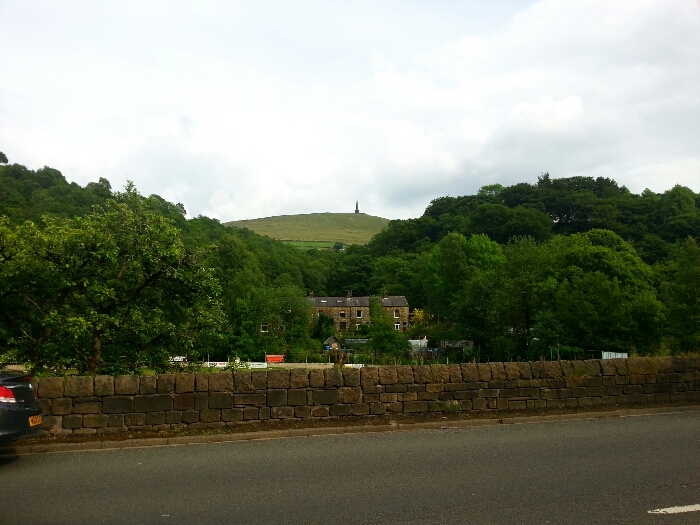 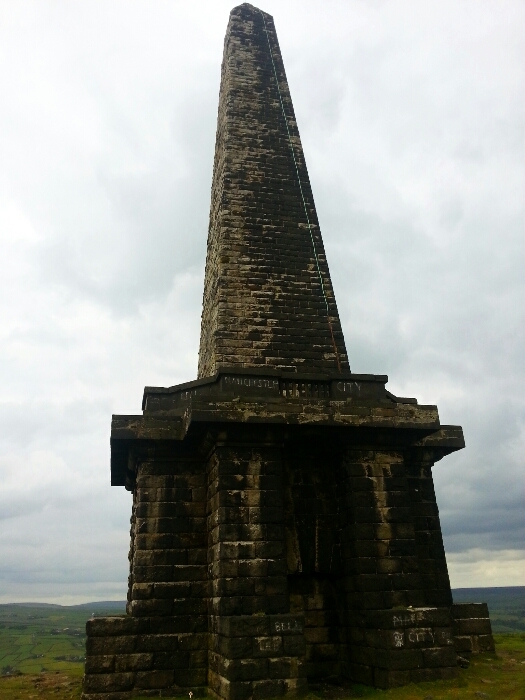 Stodley Pike is a 1,300 foot (400m) hill in the south Pennines, noted for the 121 feet (37m) Stoodley Pike Monument at its summit, which dominates the moors above Todmorden in West Yorkshire, England. 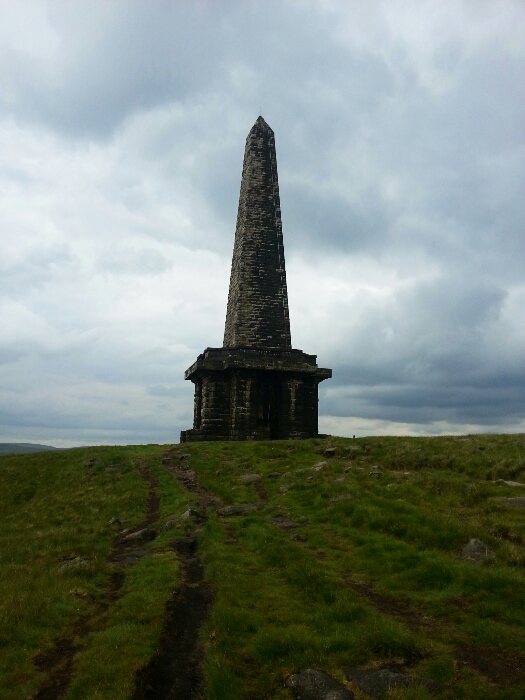 The monument was designed in 1854 by local architect James Green, and completed in 1856 at the end of the Crimean War.The monument replaced an earlier structure, started in 1814 and commemorating the defeat of Napoleon and the surrender of Paris. 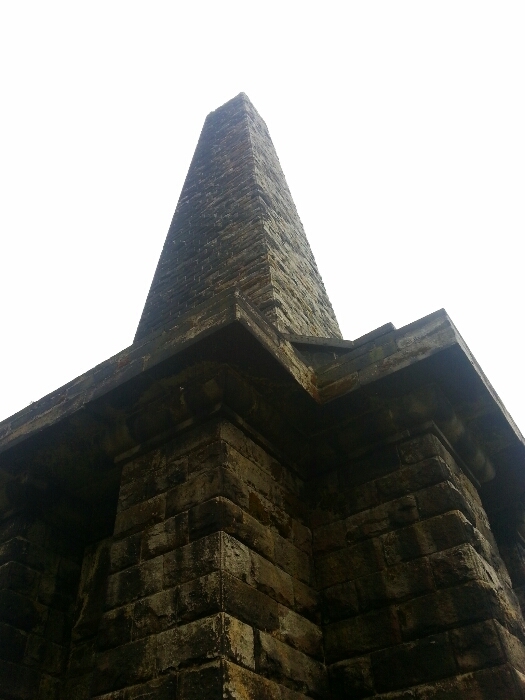 It was completed in 1815, after the Battle of Waterloo (Napoleonic Wars), but collapsed in 1854 after an earlier lightning strike, and decades of weathering. 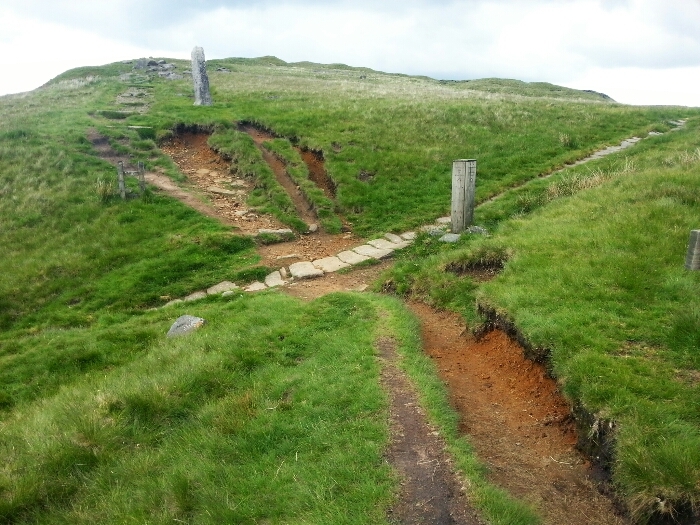 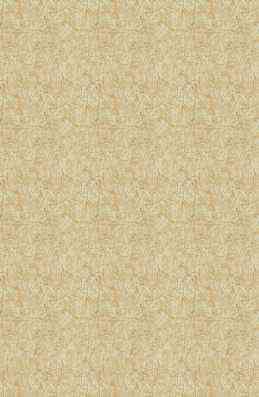 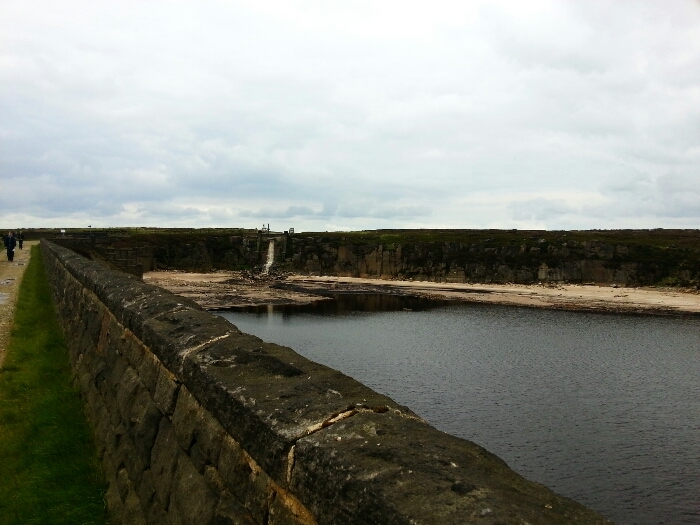 Its replacement was therefore built slightly further from the edge of the hill. 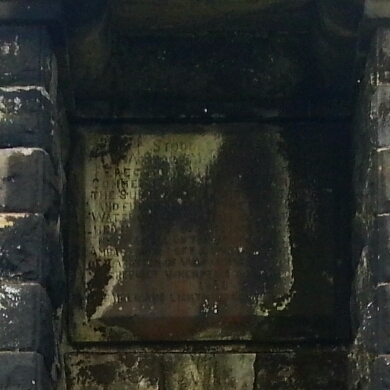 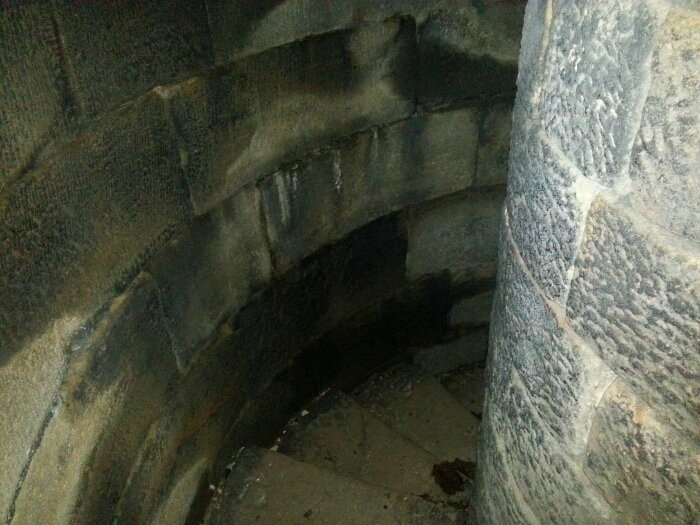 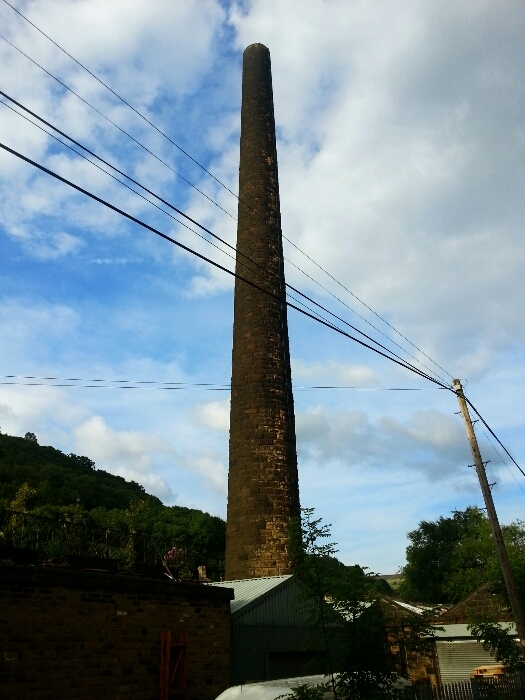 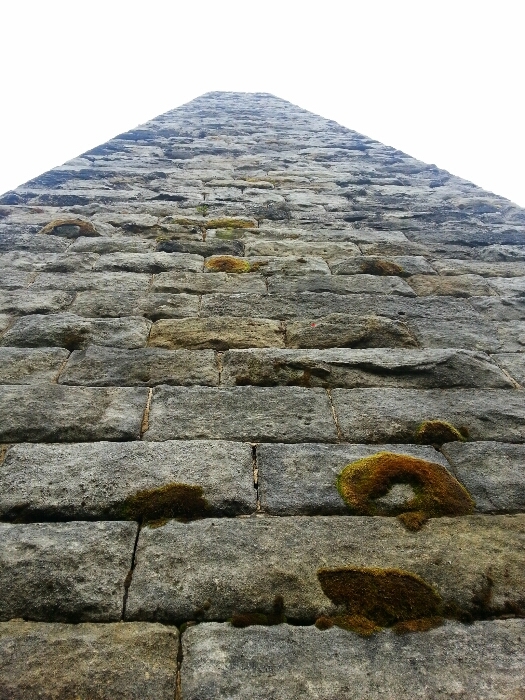 During repair work in 1889 a lightning conductor was added, and although the tower has since been struck by lightning on numerous occasions, no notable structural damage is evident. 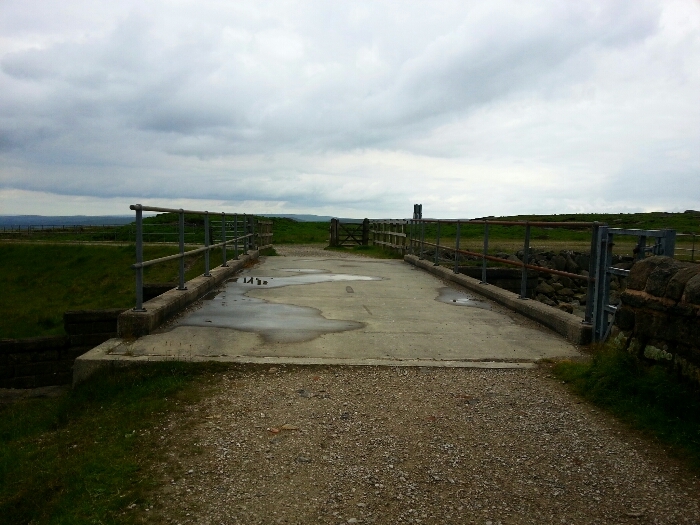 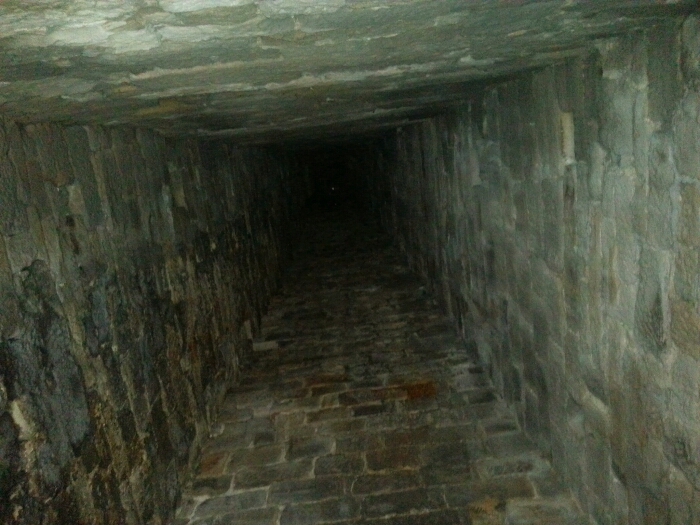 There is evidence to suggest that some sort of structure existed on the site before even this earlier structure was built. 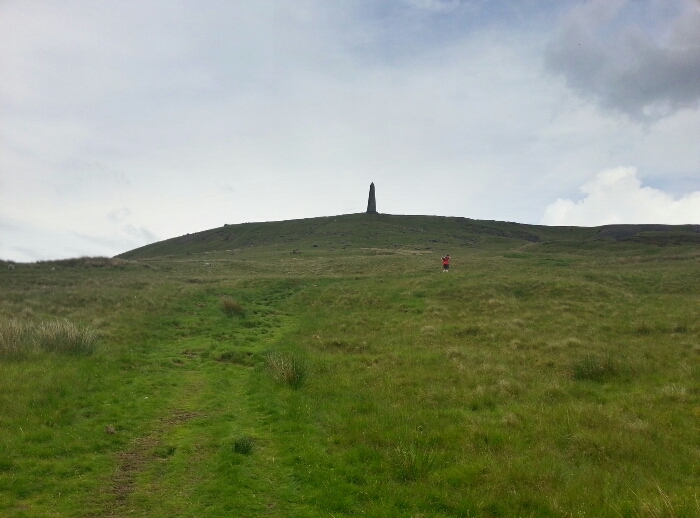 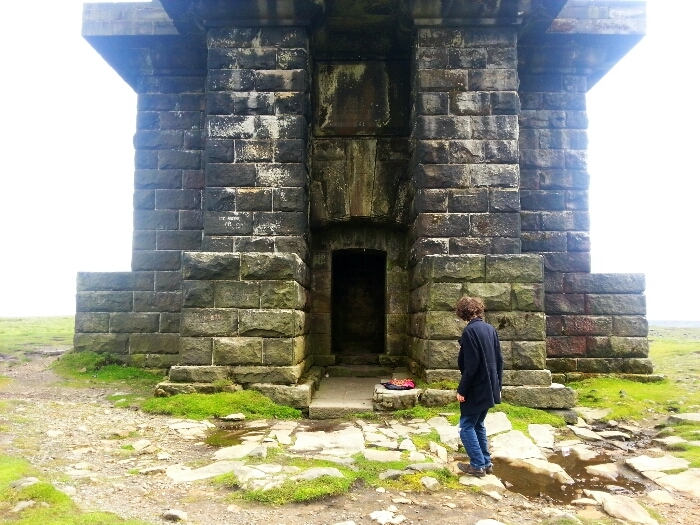 At this point we now leave the route of the Pennine Way take the footpath directly infront of the monument down the hillside be warned this path is steep and awkward but worth it. 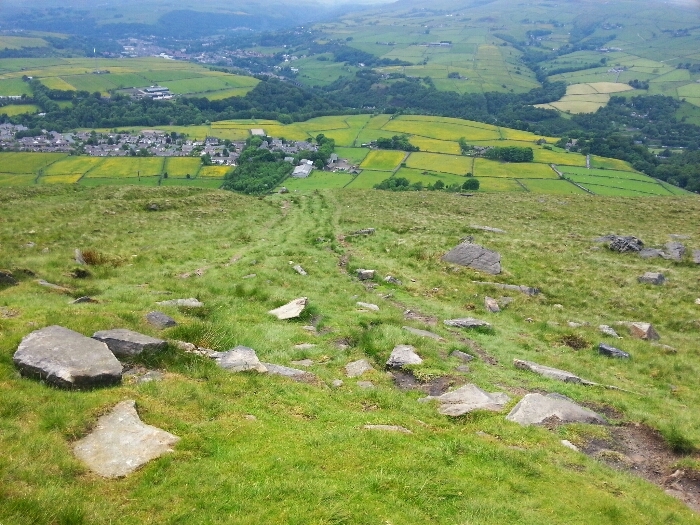 The path zig zags down the hill. 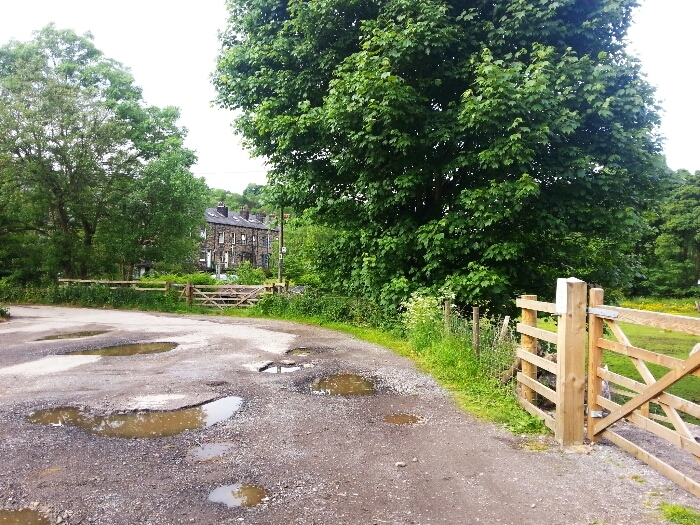 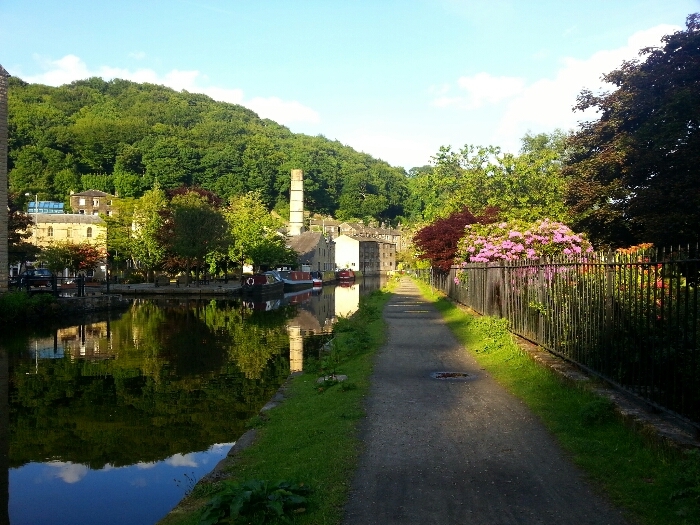 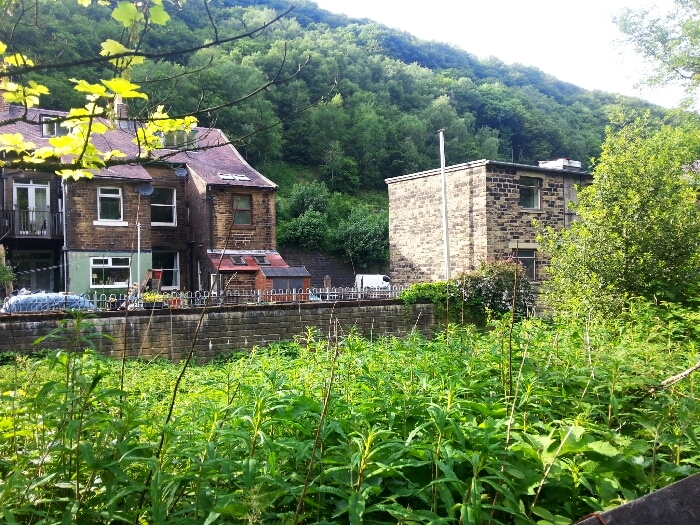 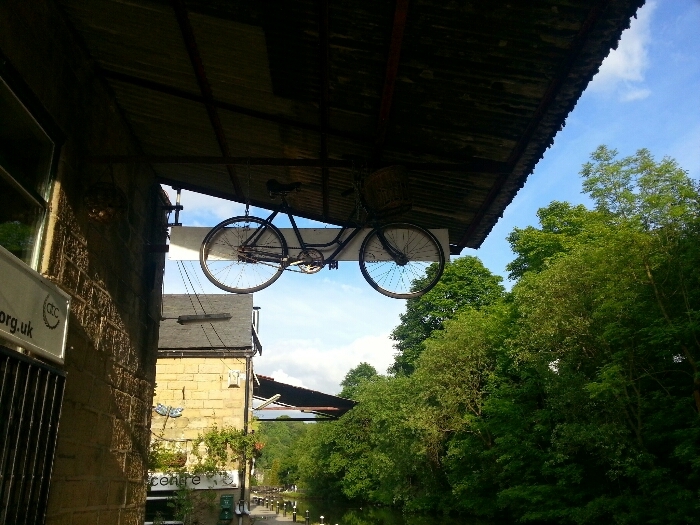 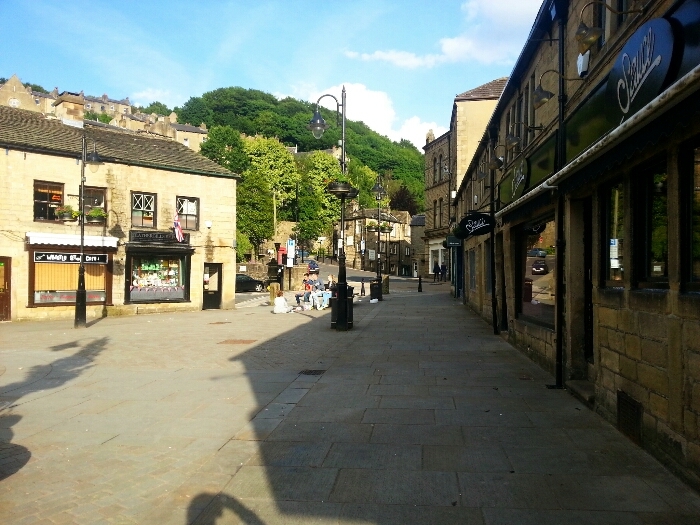 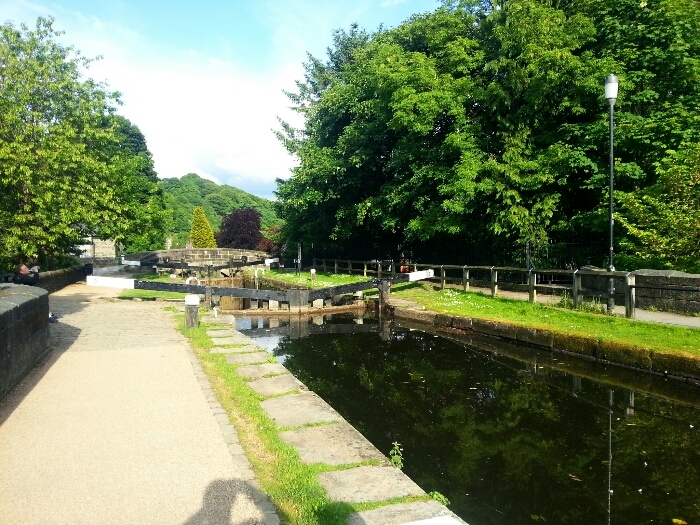 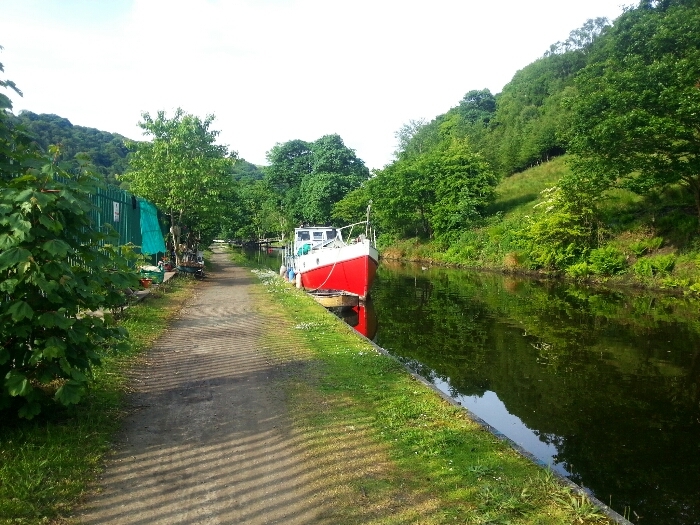 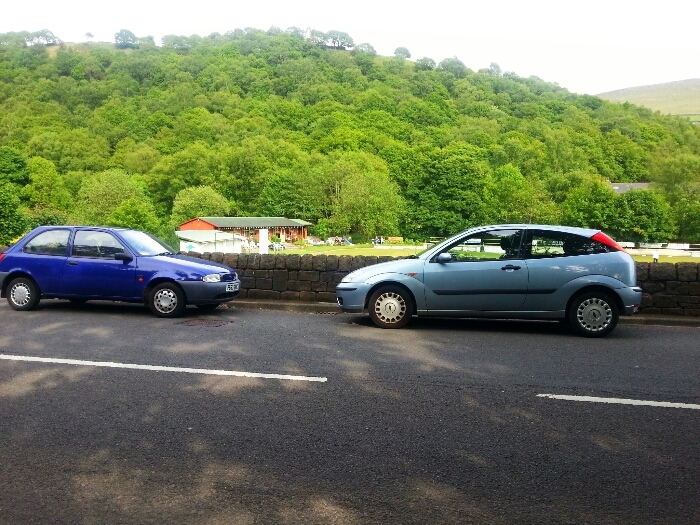 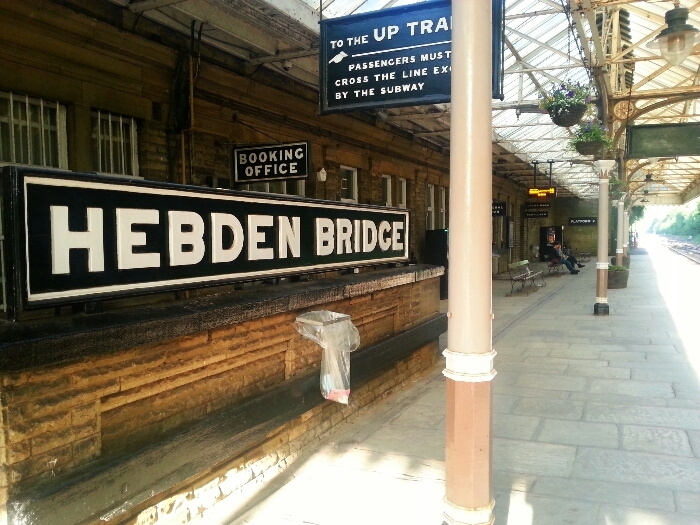 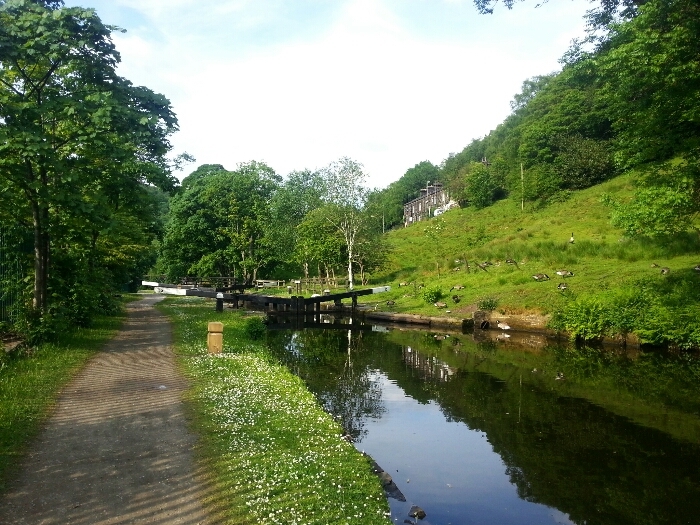 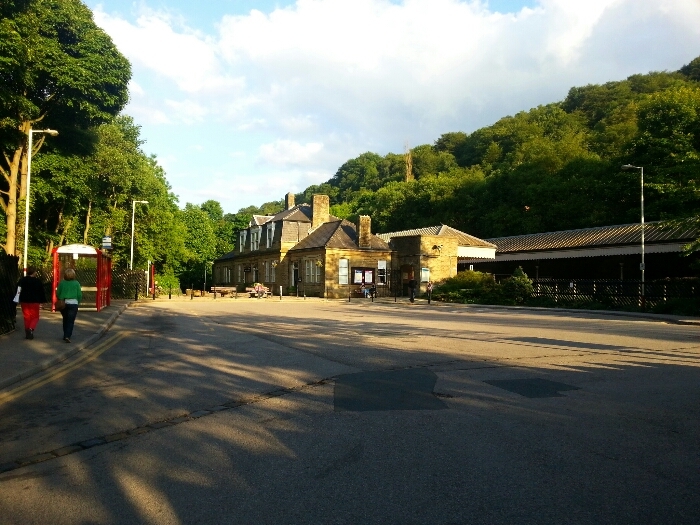 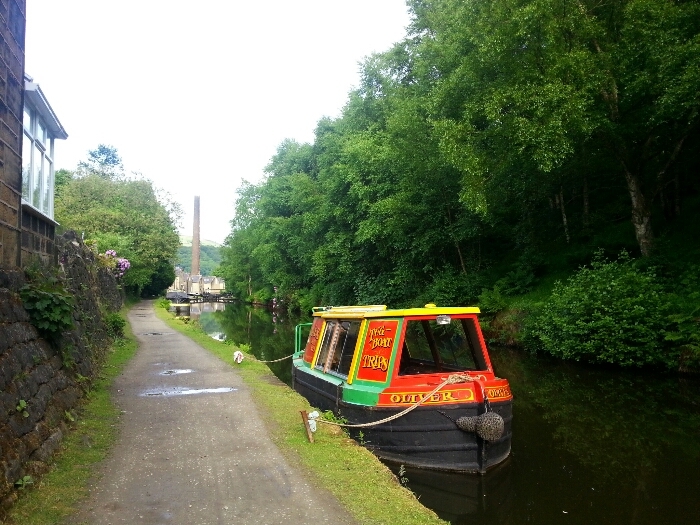 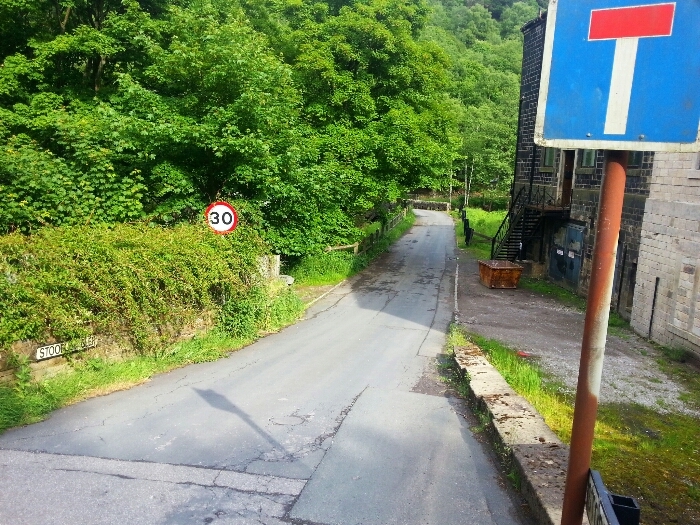 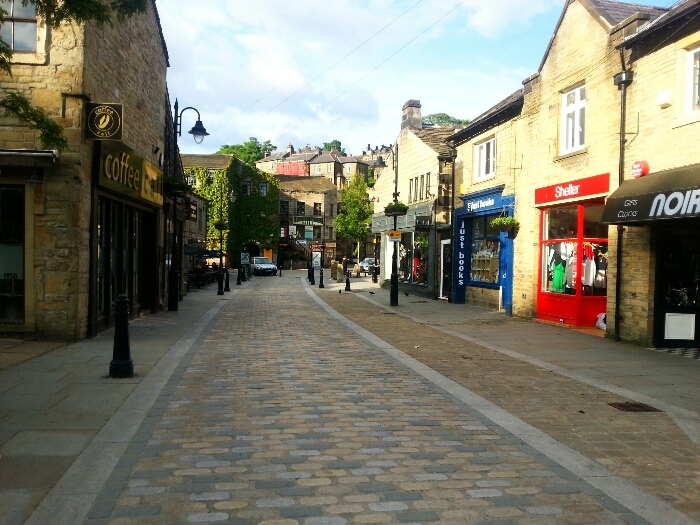 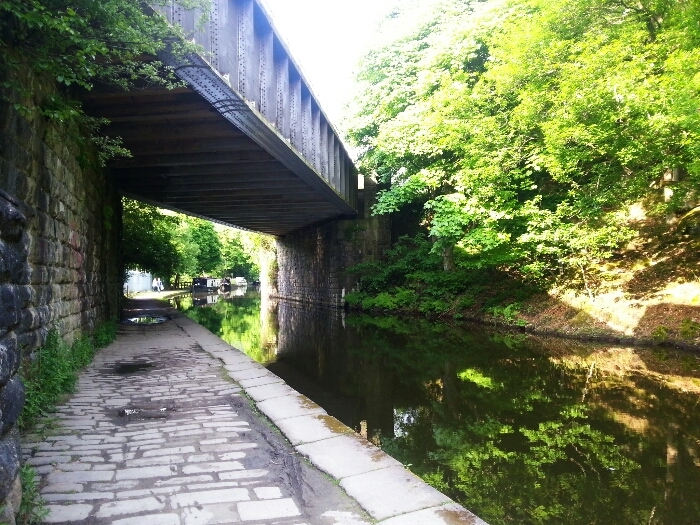 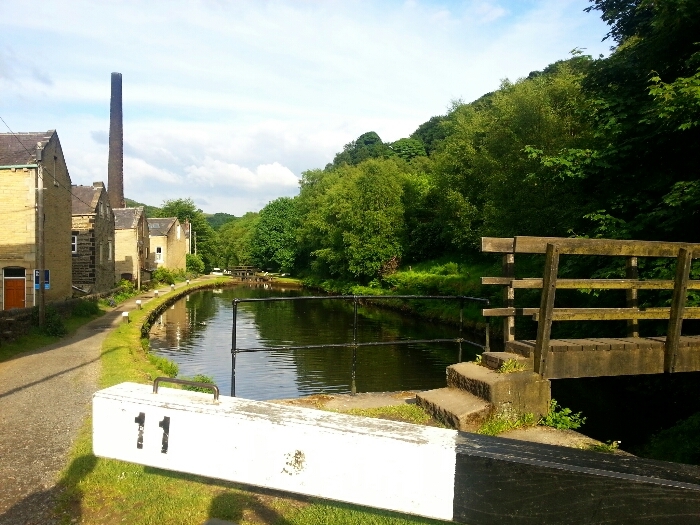 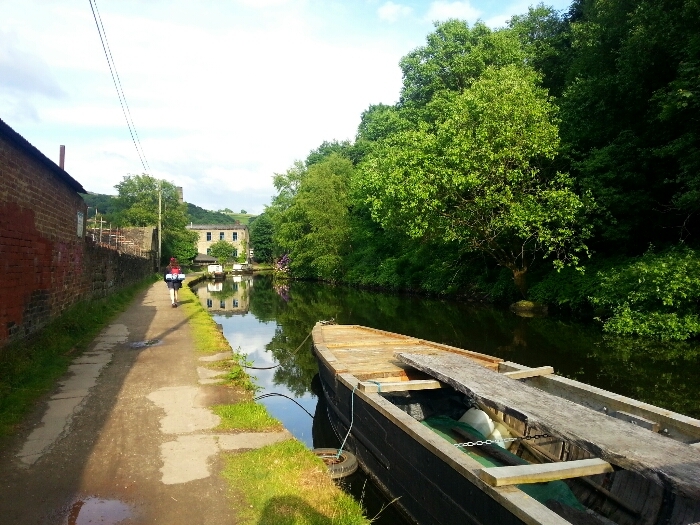 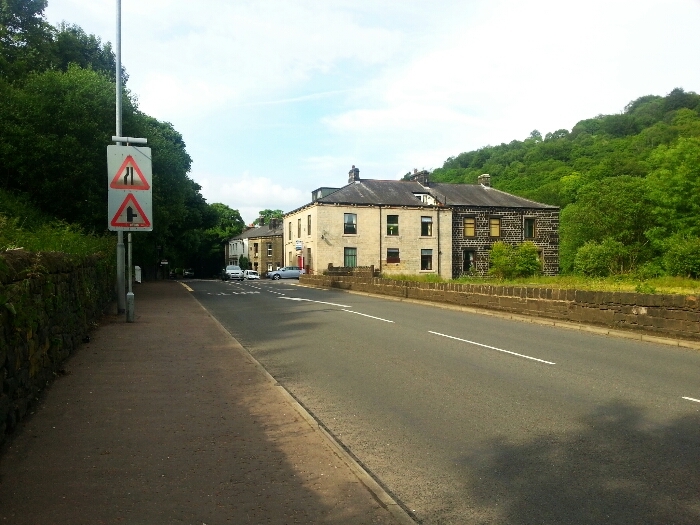 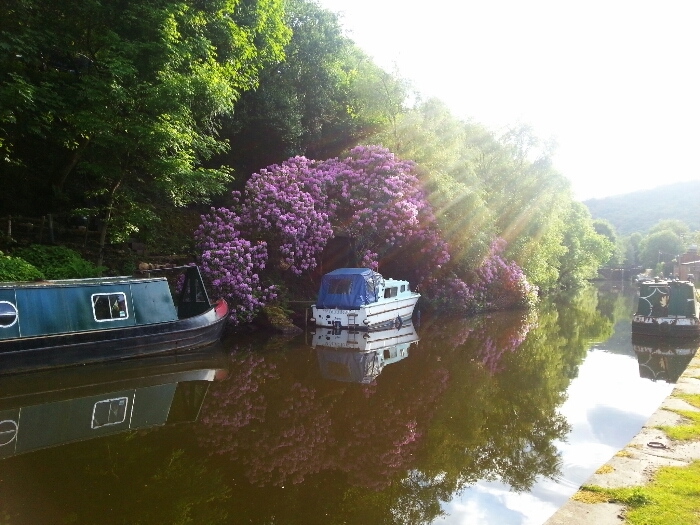 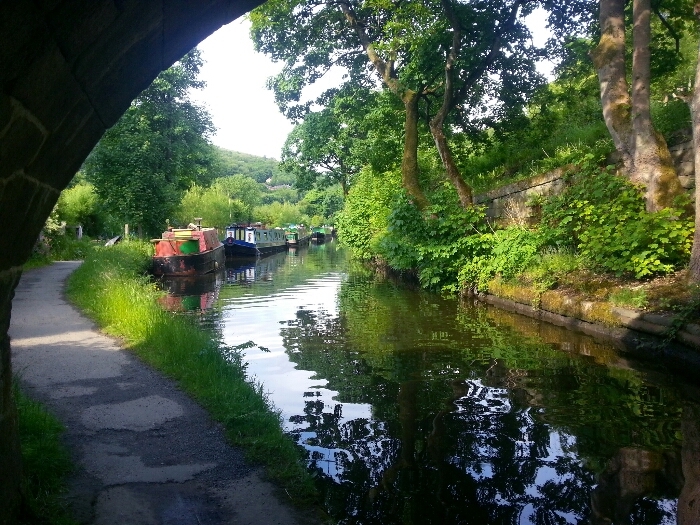 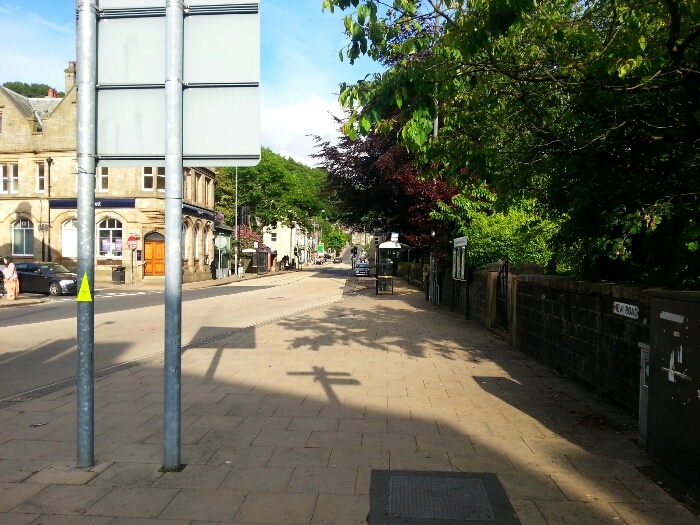 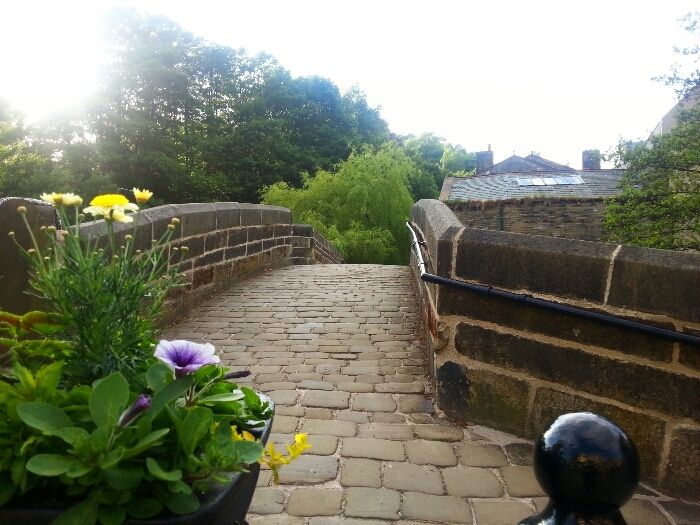 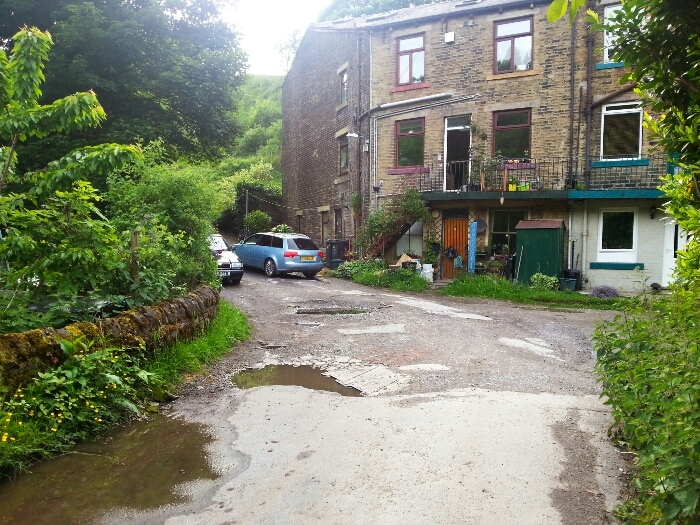 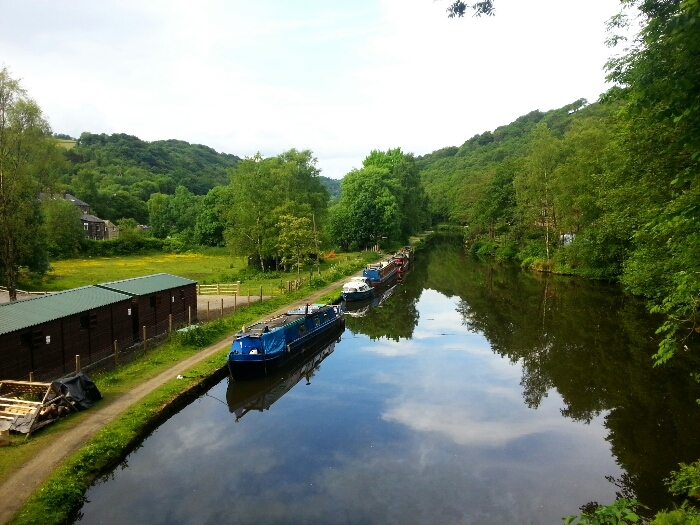 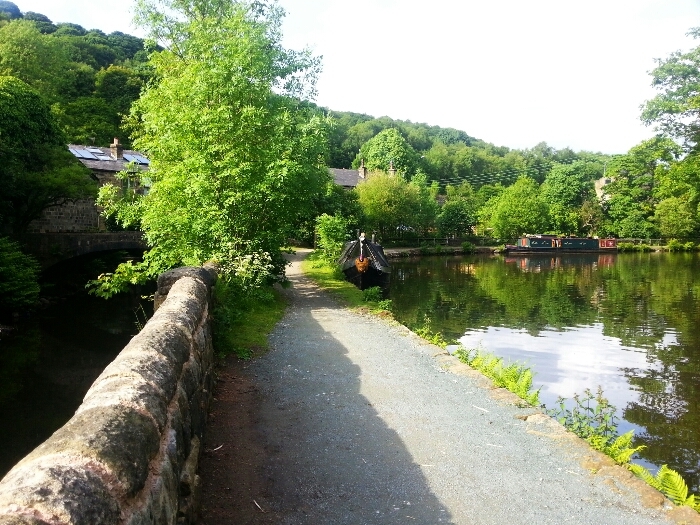 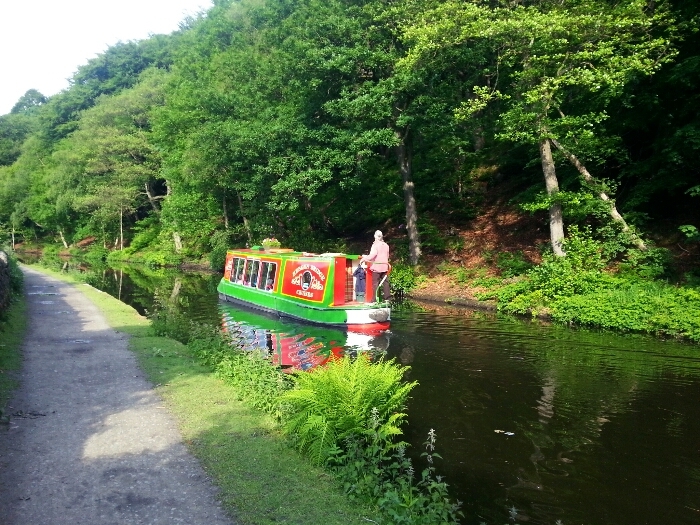 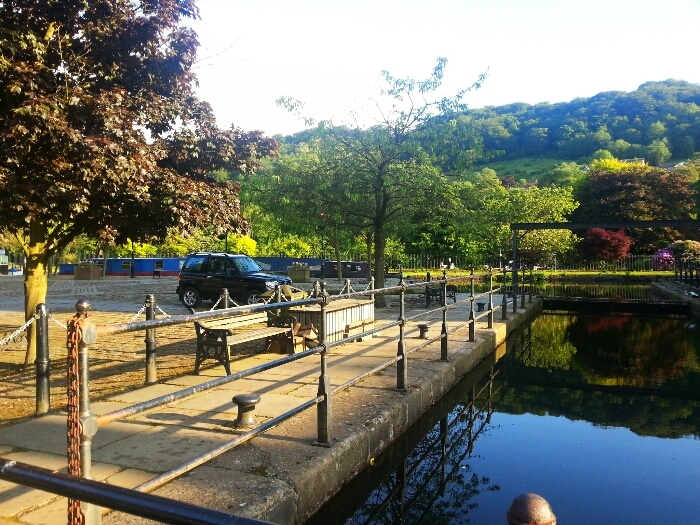 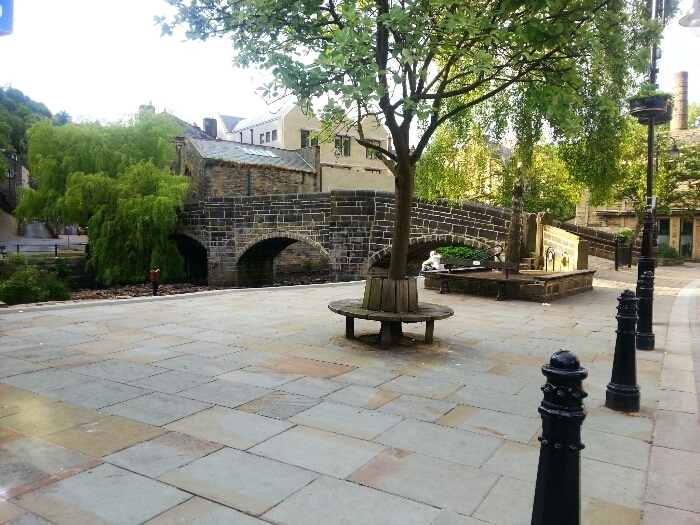 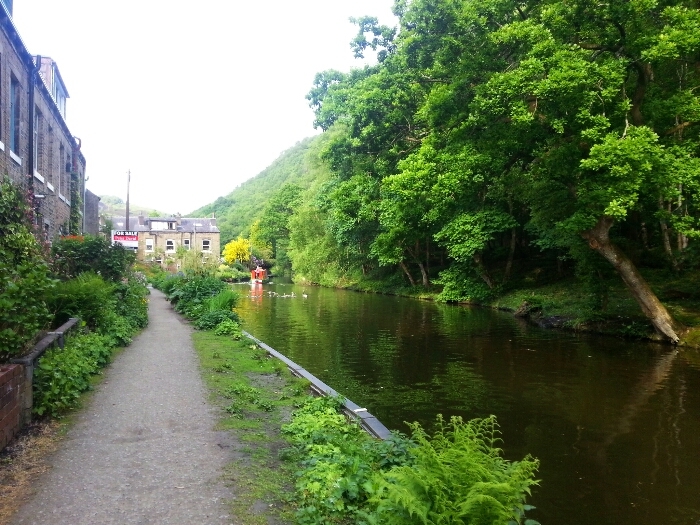 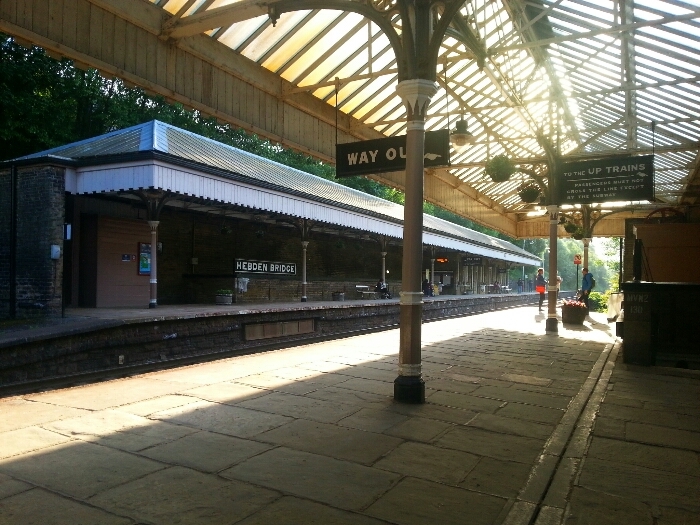 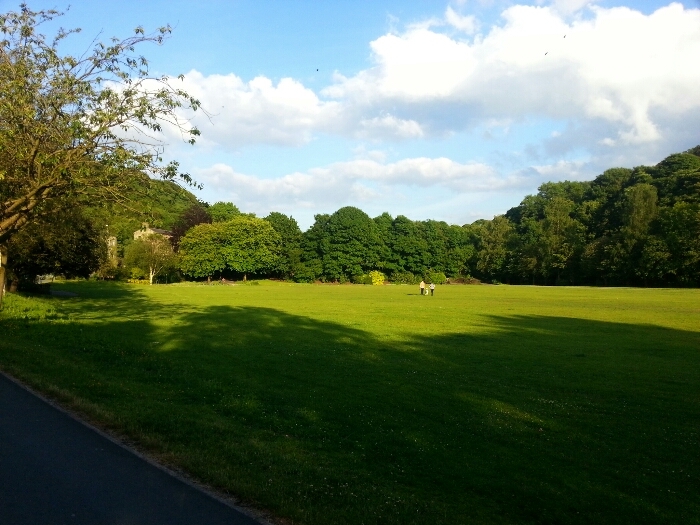 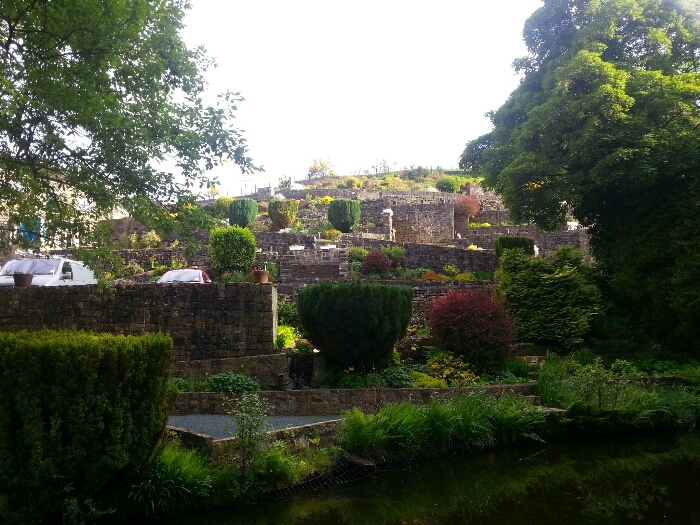 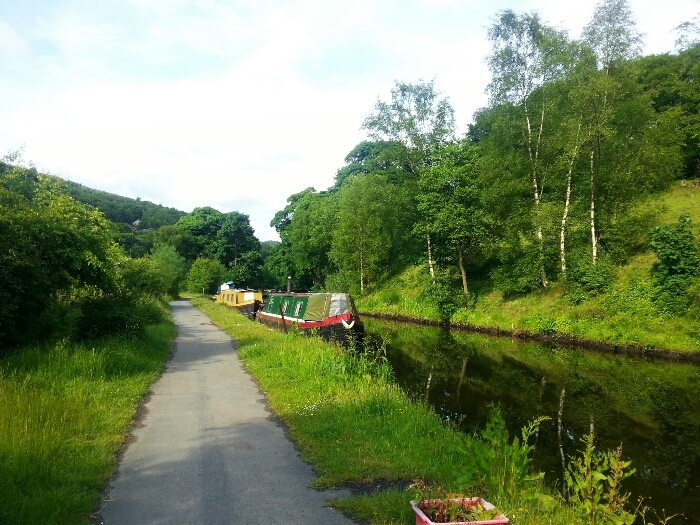 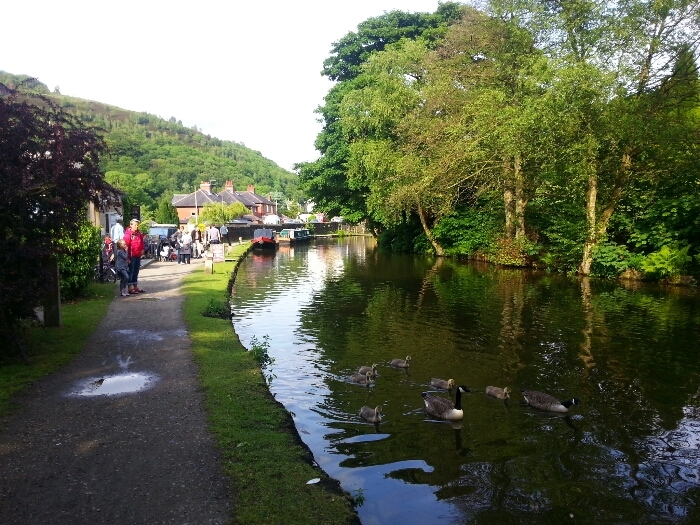 From the centre of Hebden Bridge you could take a bus to Halifax, Todmorden, Burnley or Rochdale or you could walk to the station to catch a train. 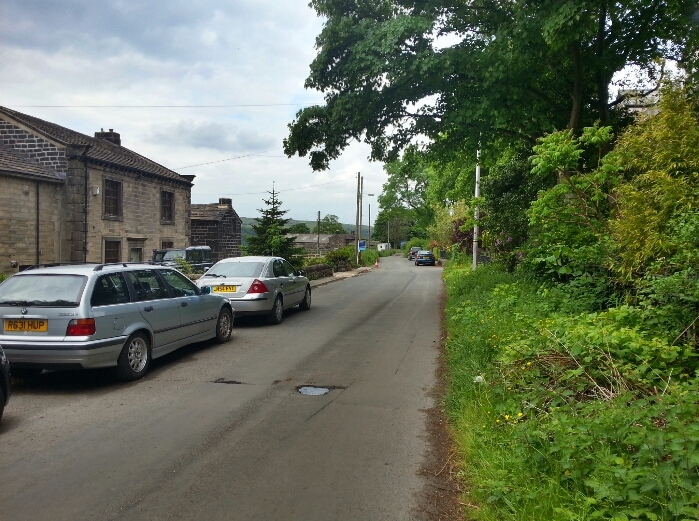 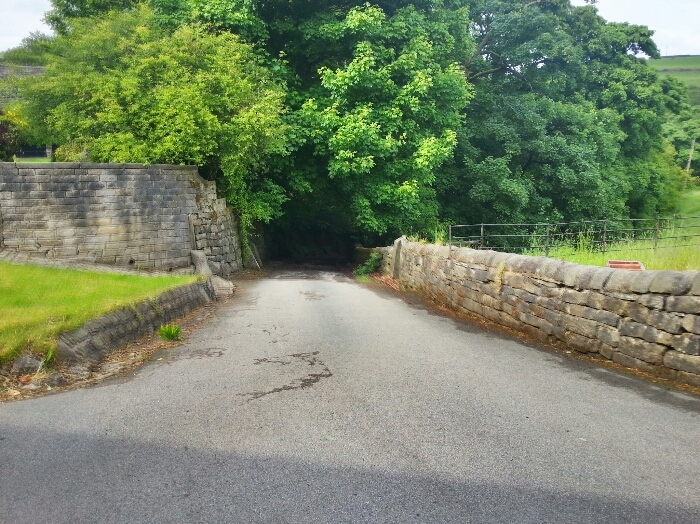 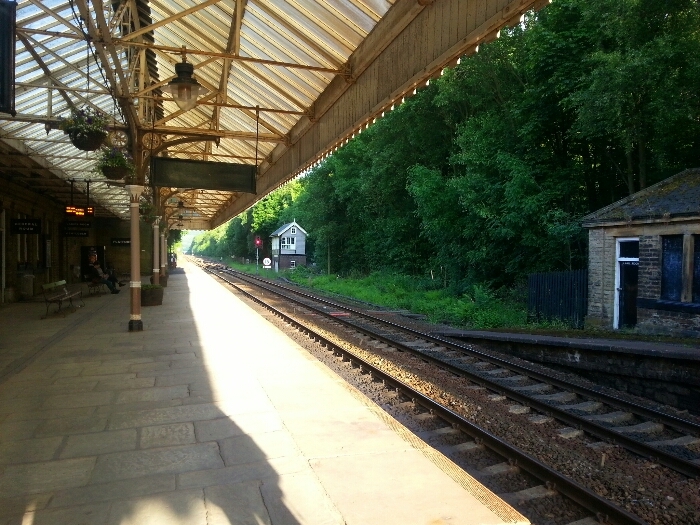 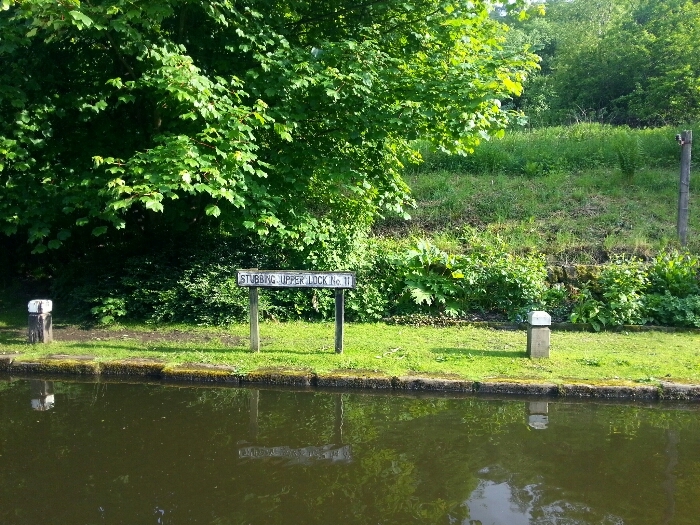 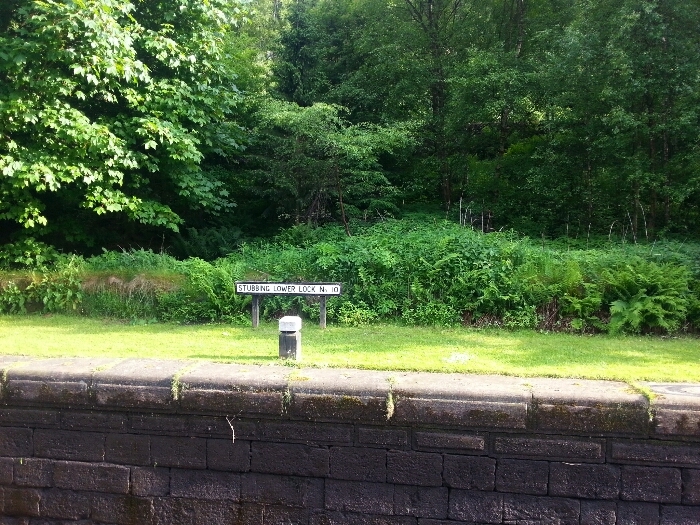 If you choose to catch a train you could follow the A646 in the direction of Halifax to get to the station or alternatively you could follow the towpath. 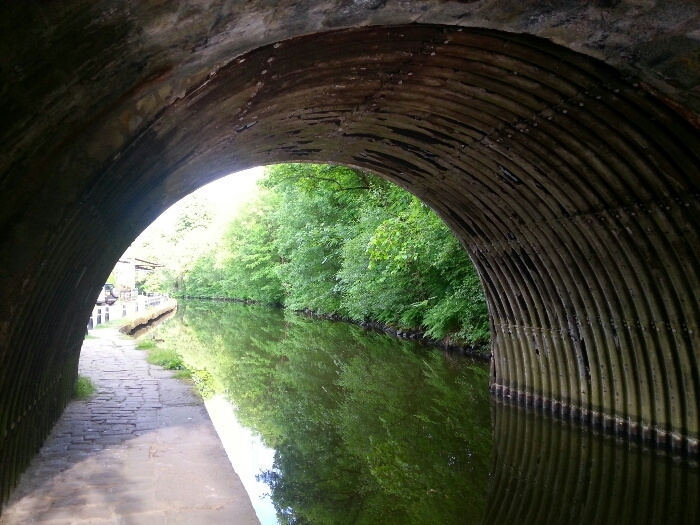 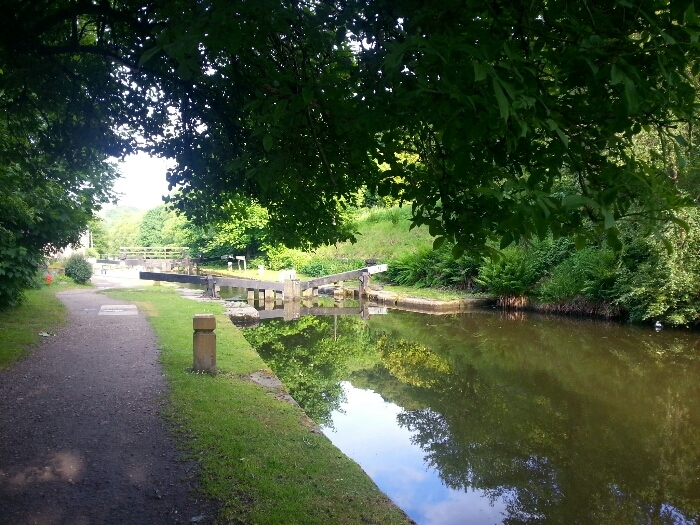 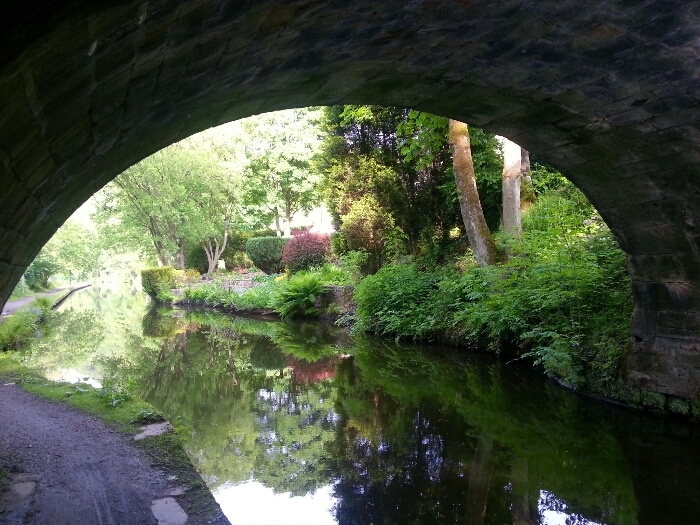 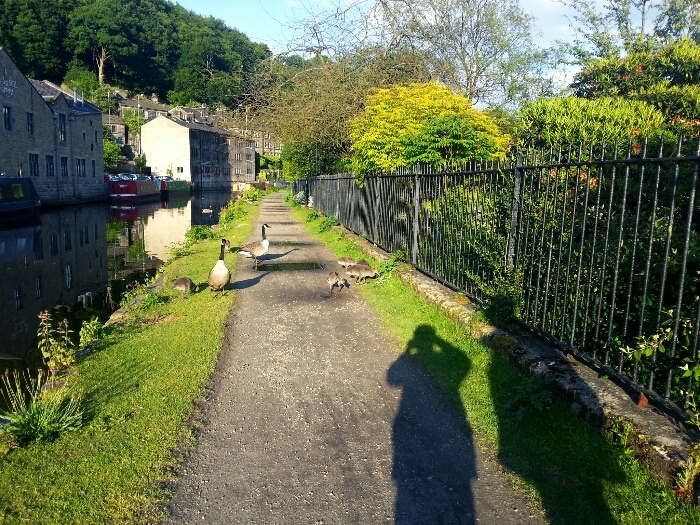 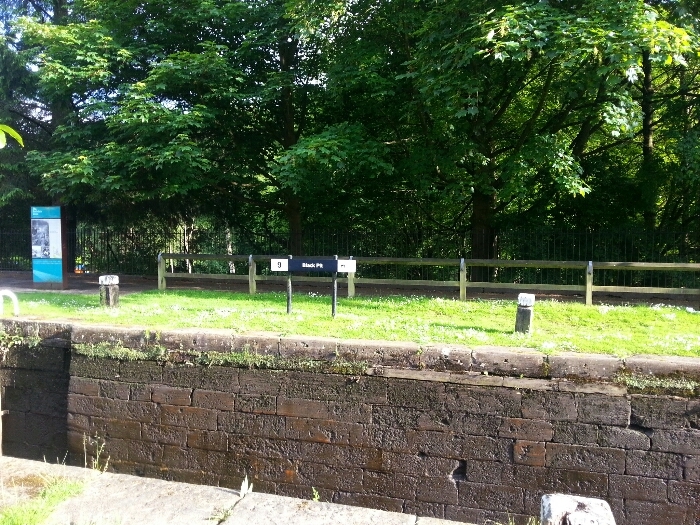 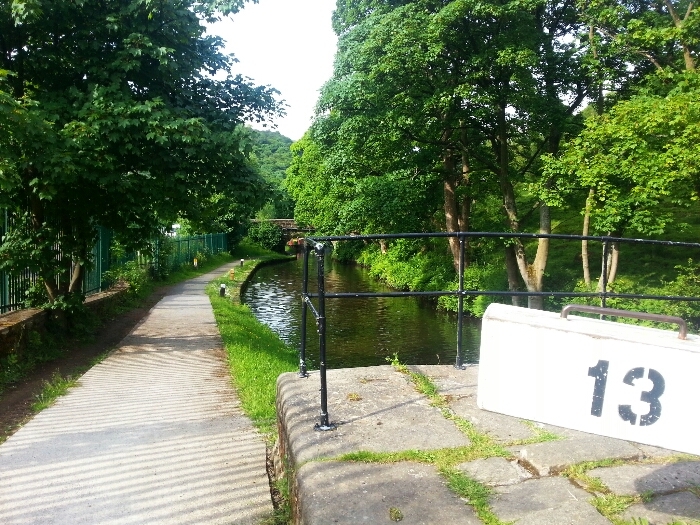 If you choose the towpath cross over the canal as it changes sides here.